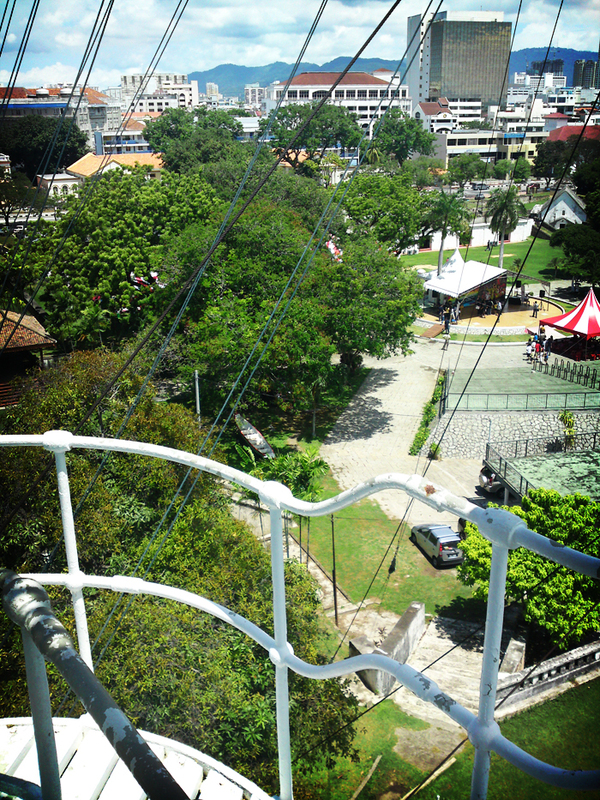 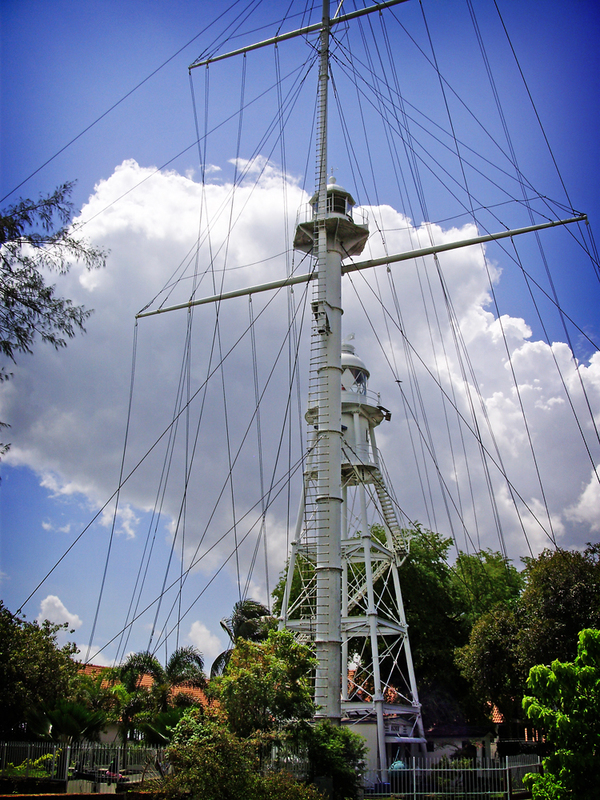 Located within Fort Cornwallis, this historical lighthouse is one of the oldest lighthouses in Malaysia. 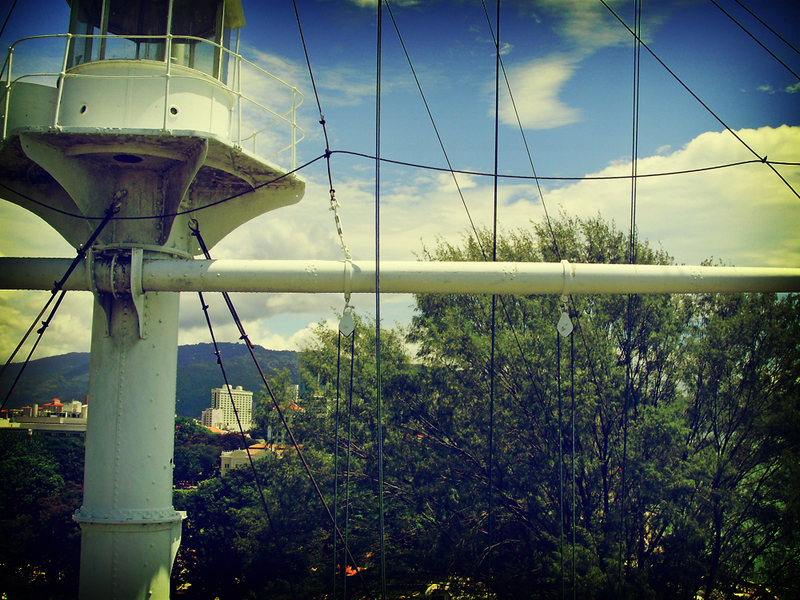 Built in 1882 during the British administration, it was known as the Fort Point Lighthouse. 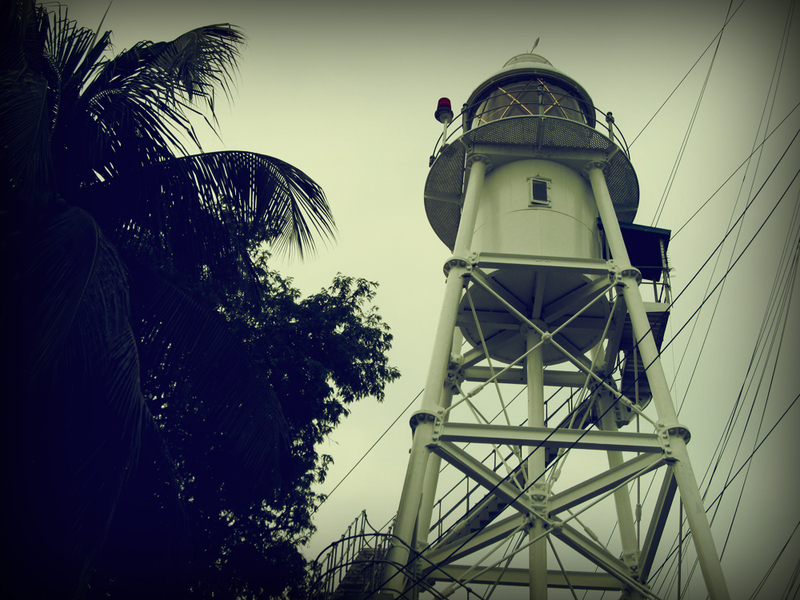 The lighthouse twas made of steel framework, which is a stark contrast with the rest of the fort. 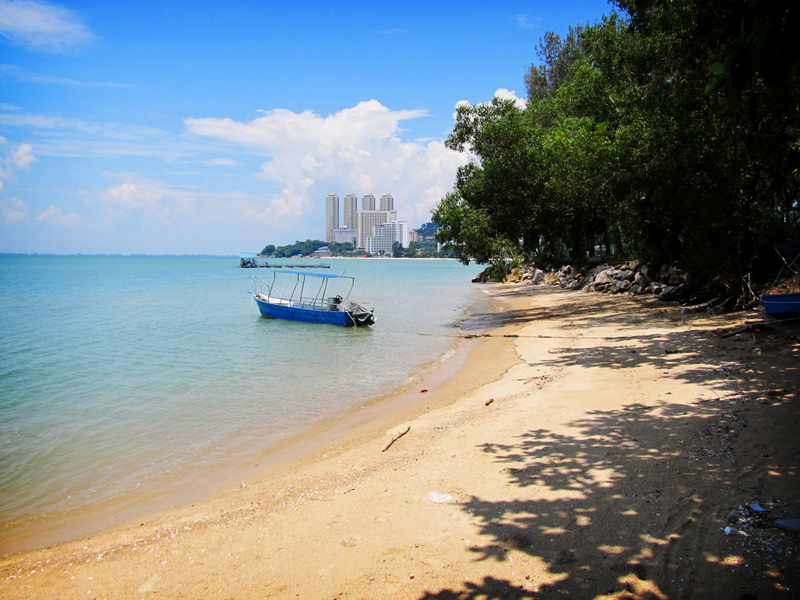 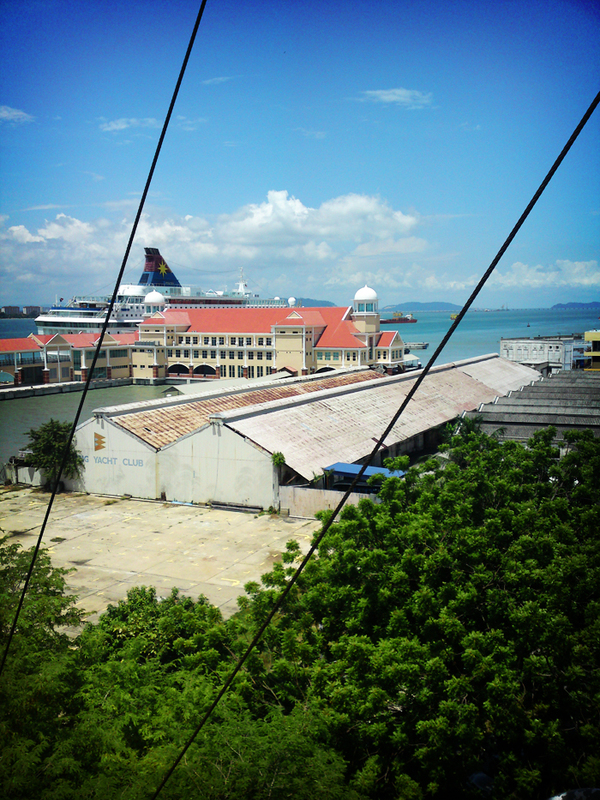 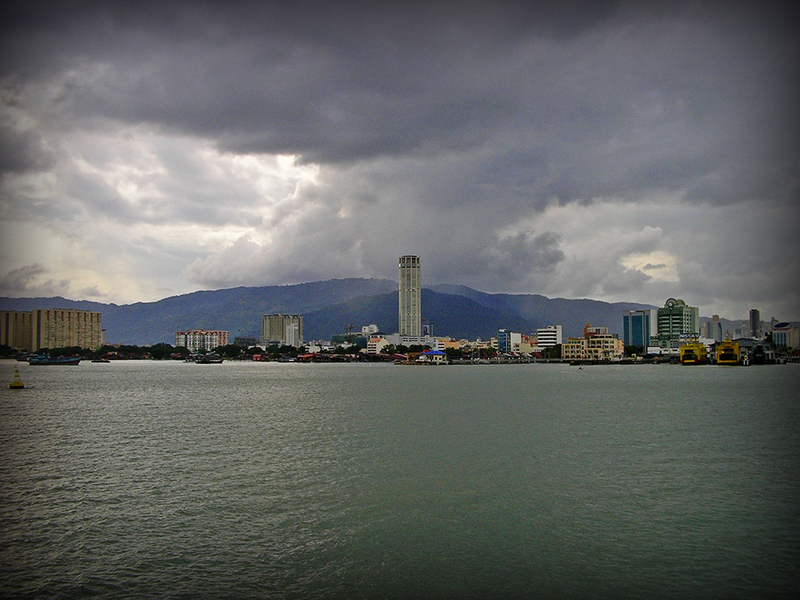 During the renovation in 1914 it was renamed as Penang Harbour Lighthouse. 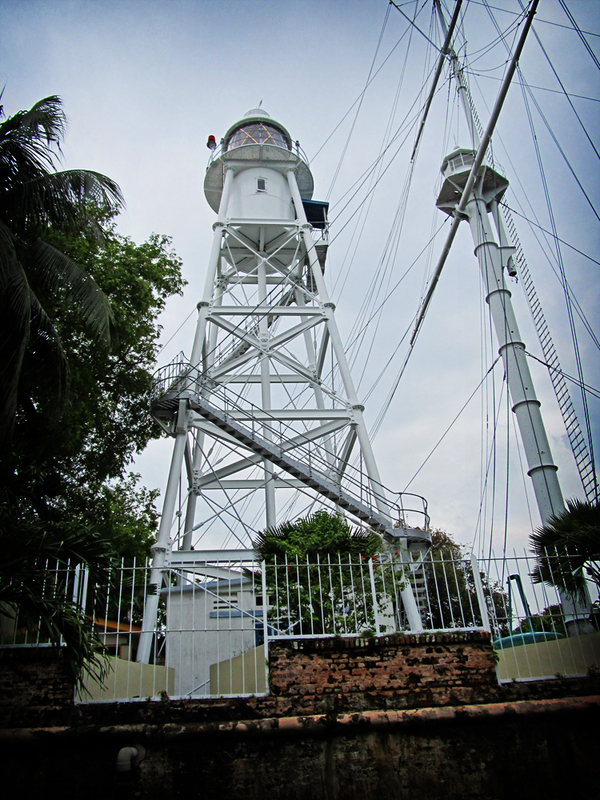 The 21 meters high minaret is made from white iron frame with depth filed covering of 16 nautical miles deep. 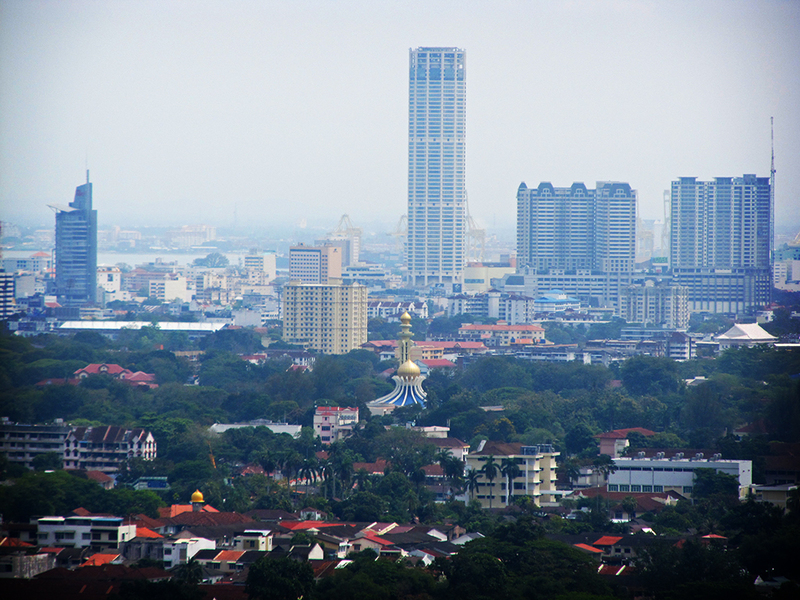 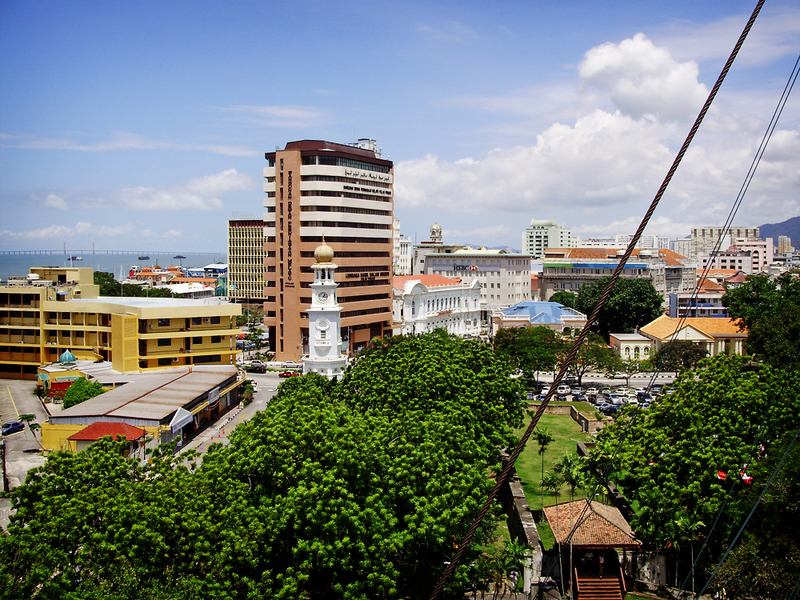 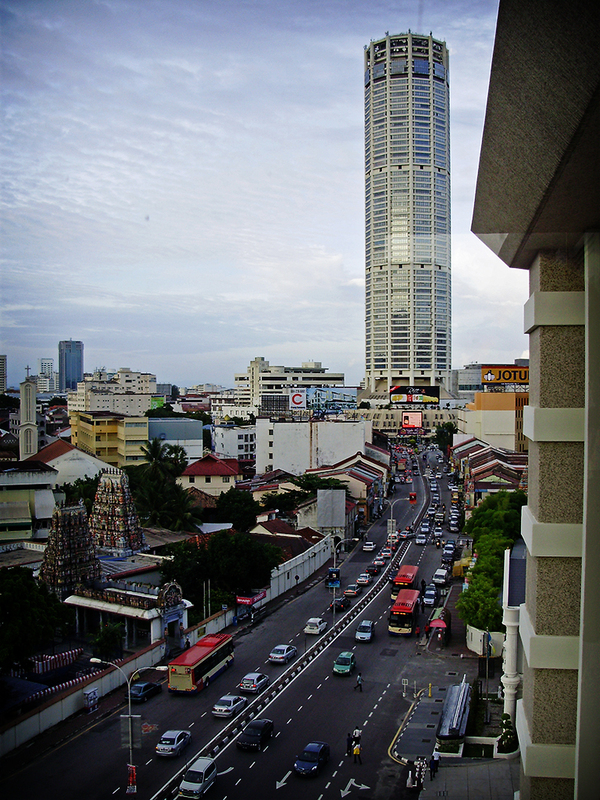 As the sixth tallest building in Malaysia, the Komtar Tower located at the heart of George Town, is the most recognizable landmark of Penang. 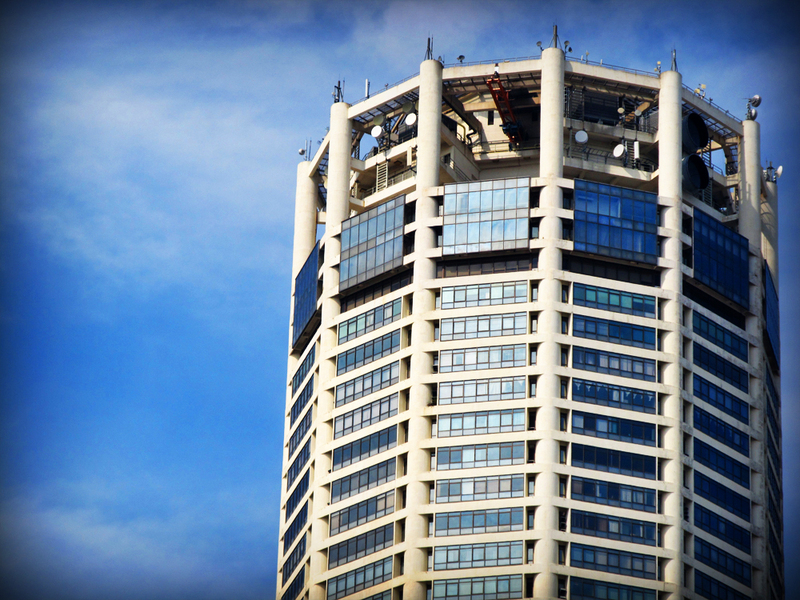 The building of the tower and its complex started in 1974 which was officiated by the late Tun Abdul Razak, the second Prime Minister of Malaysia. 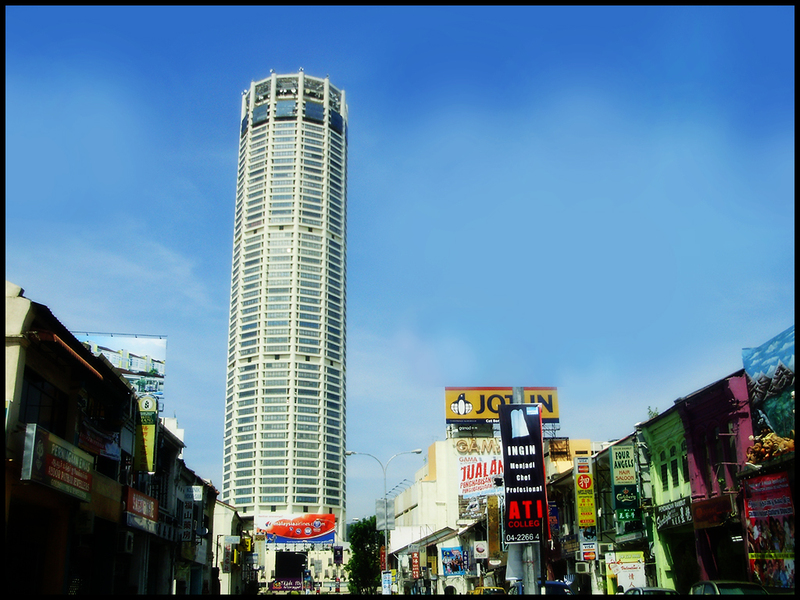 The word KOMTAR is also a portmanteau of Kompleks Tun Abdul Razak. 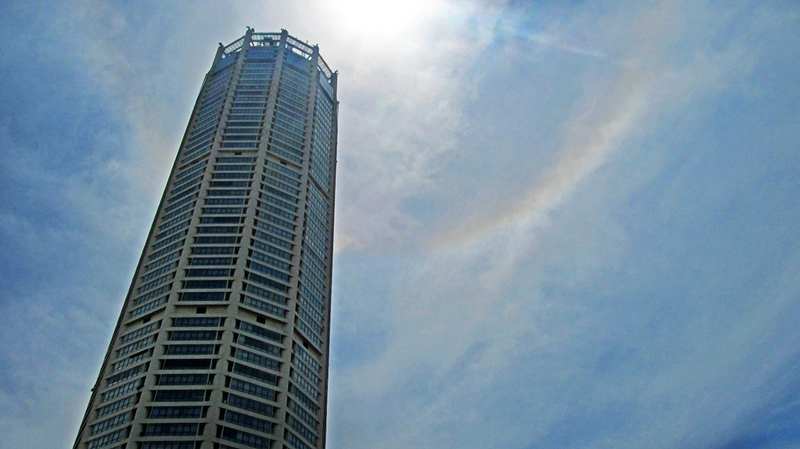 Completed in 1988, the 65-storey tower is a 232 m (761 ft) 12-sided geometric block atop a 4-storey podium. 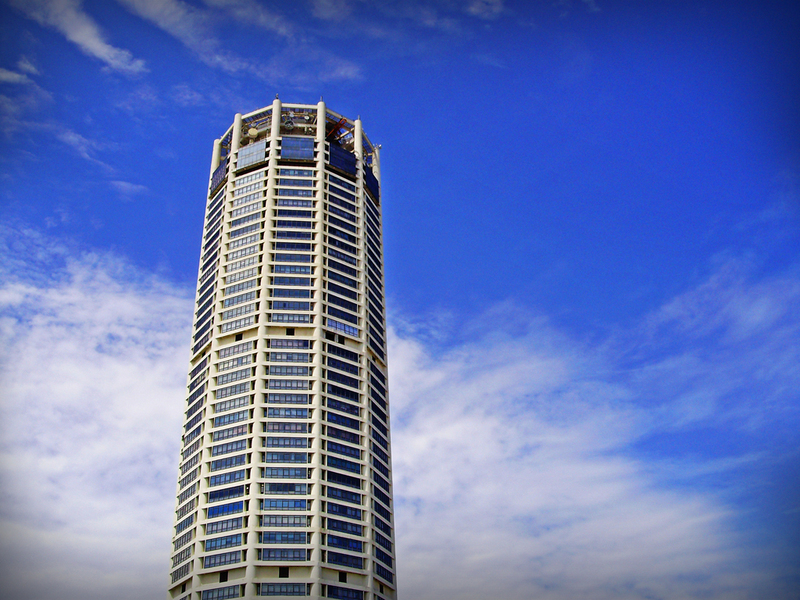 The complex comprises office and retail commercial space as well as public and recreational facilities. 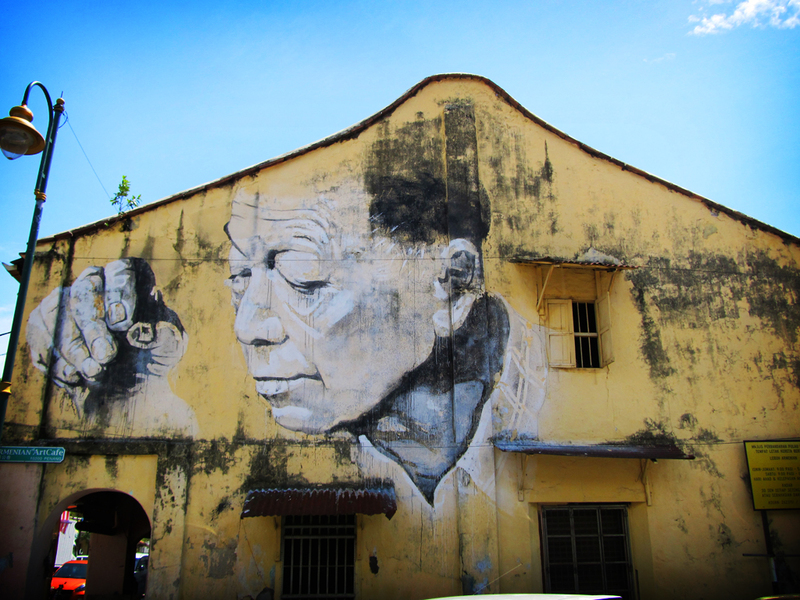 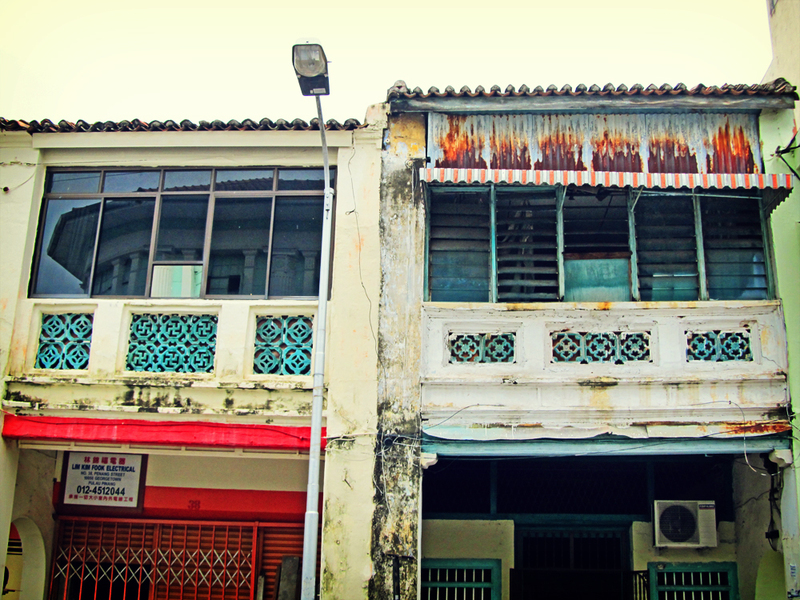 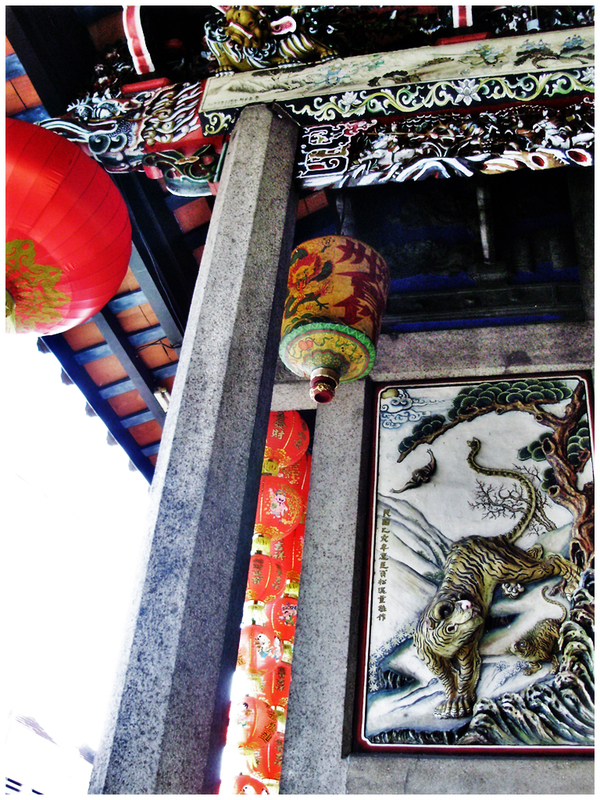 A wall mural spotted at an old building located at the centre of George Town Heritage Zone in Penang. 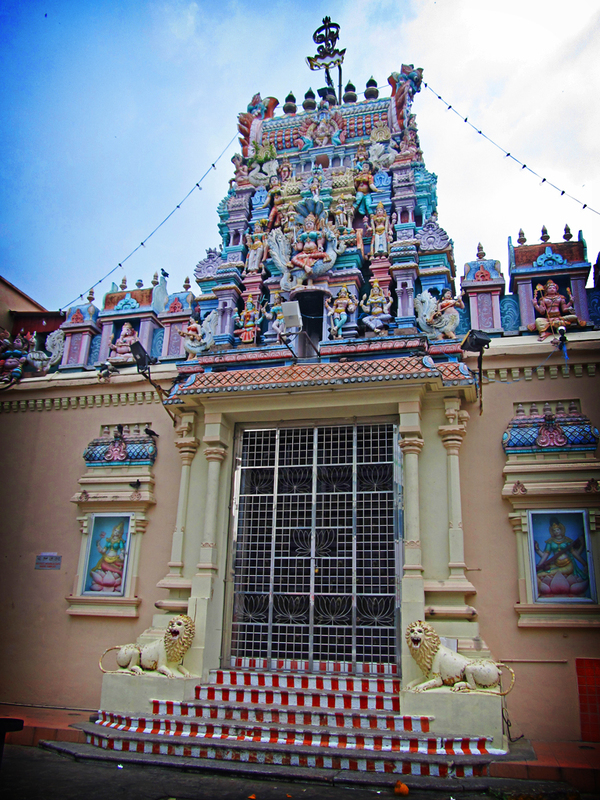 Located at Queen Street, the Arulmigu Sri Mahamariamman Temple is the oldest Hindu temple in Penang wich was built in 1833. 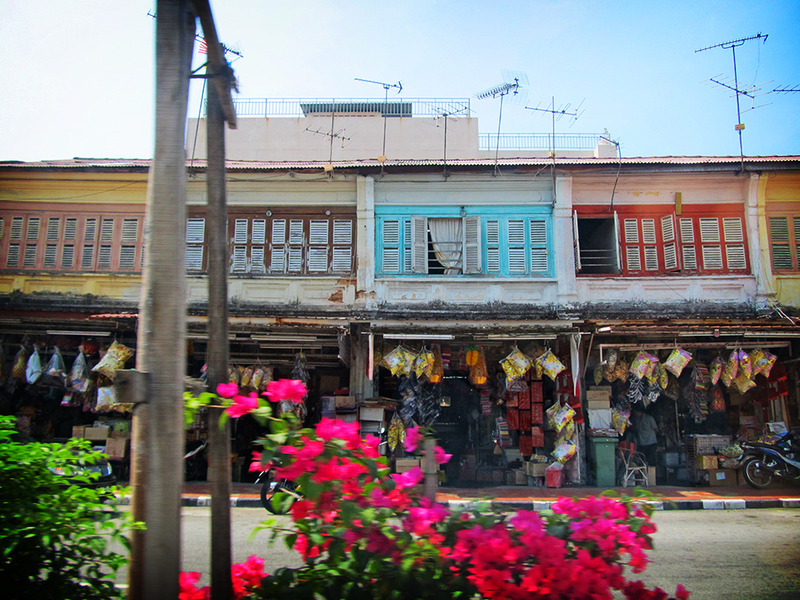 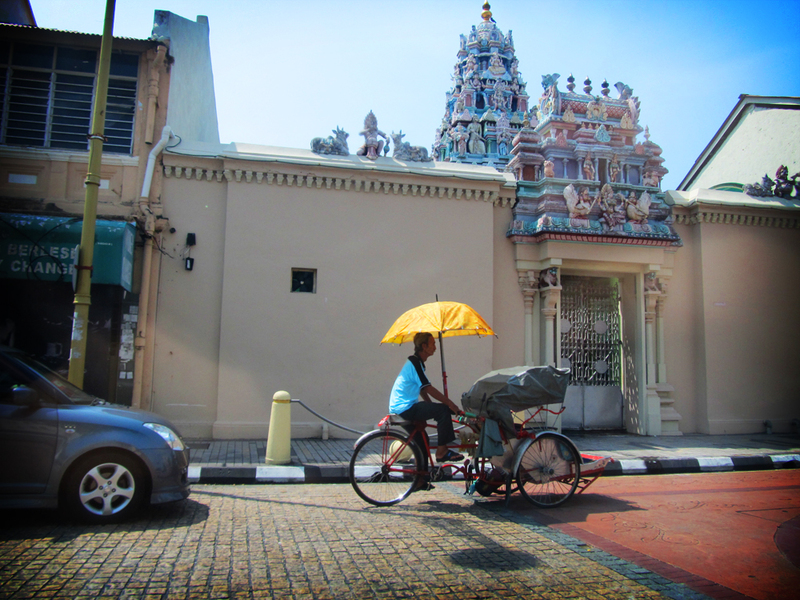 The temple is also referred as Mariamman Temple or Queen Street Indian Temple. 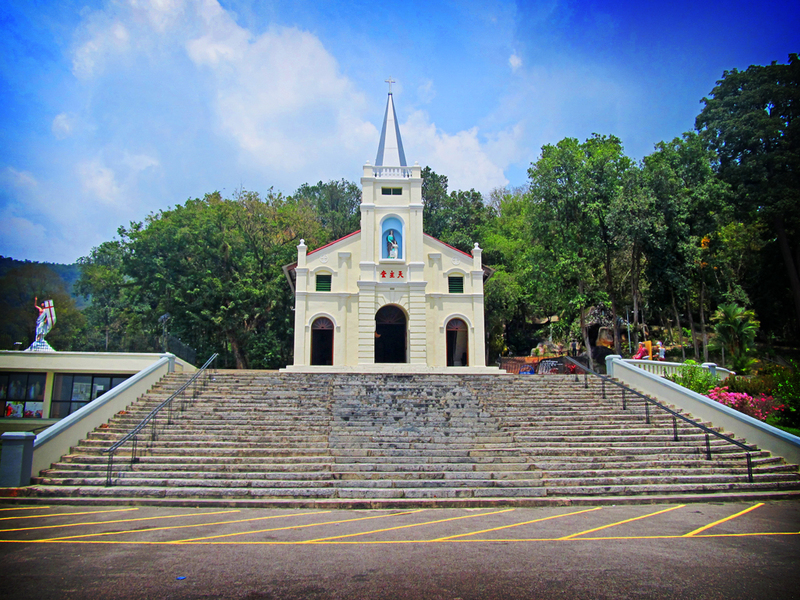 Since 1833, the temple has stood at the same location for more than 200 years. 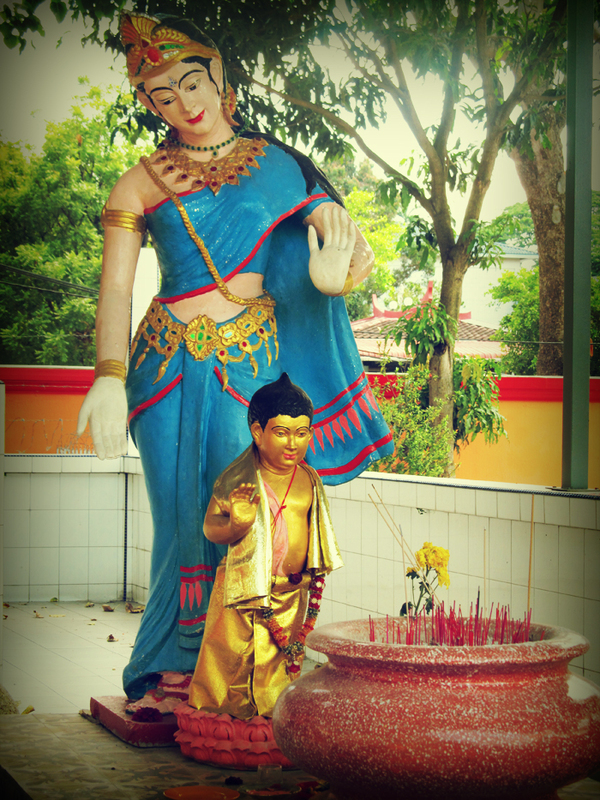 Like other Hindu temples, fascinating sculptures of gods and goddesses can be found over its main entrance and facade. 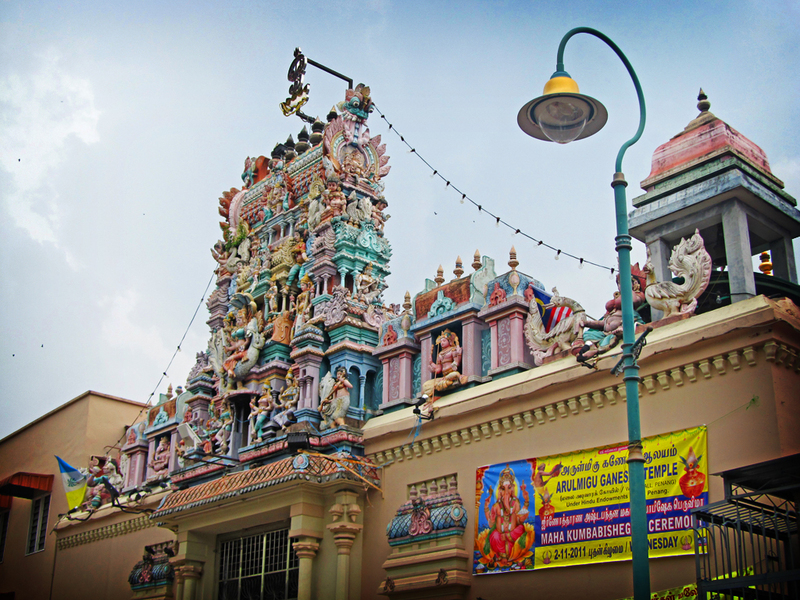 Built in the south Indian Dravidian style, the temple has an impressive gopuram (tower). 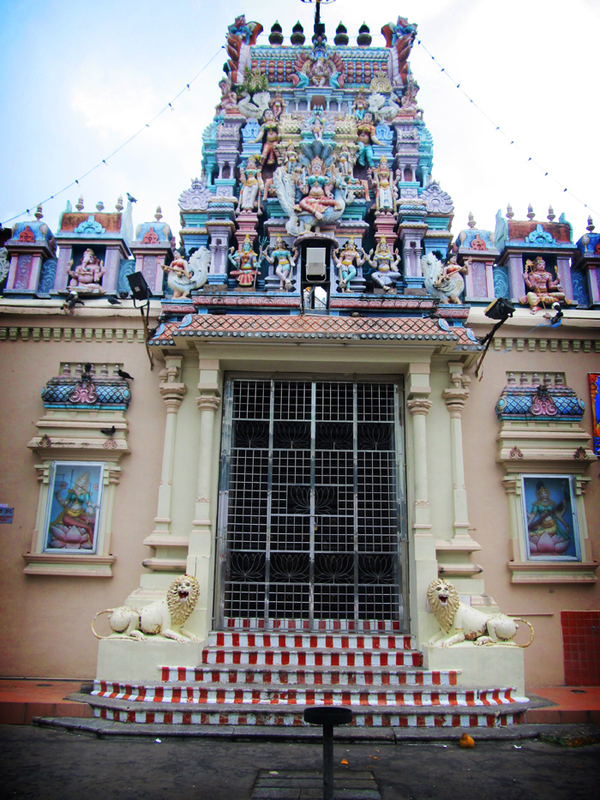 Rising above the entrance, it features Hindu deities, soldiers and floral decorations. 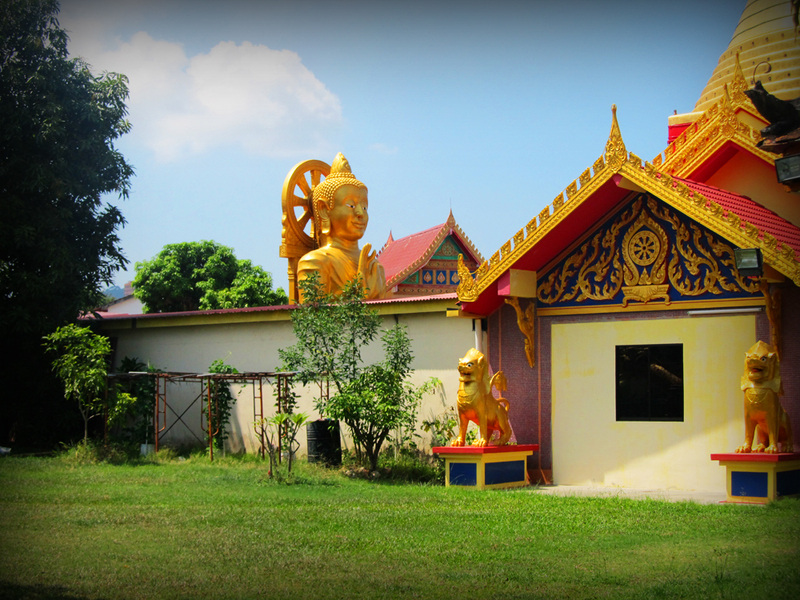 The back view of the temple. 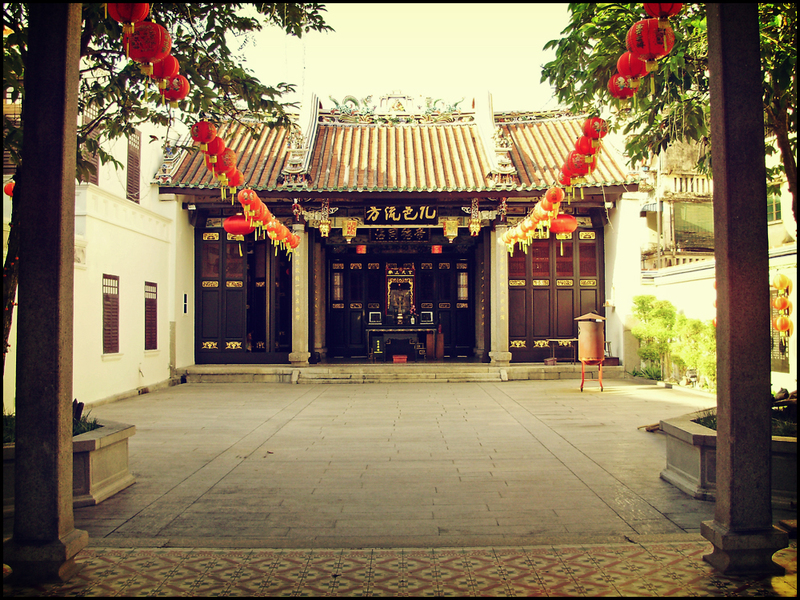 The Han Jiang Teochew Temple is a Chinese temple located along Lebuh Chulia in George Town and right at the cross junction of Jalan Masjid Kapitan Keling. 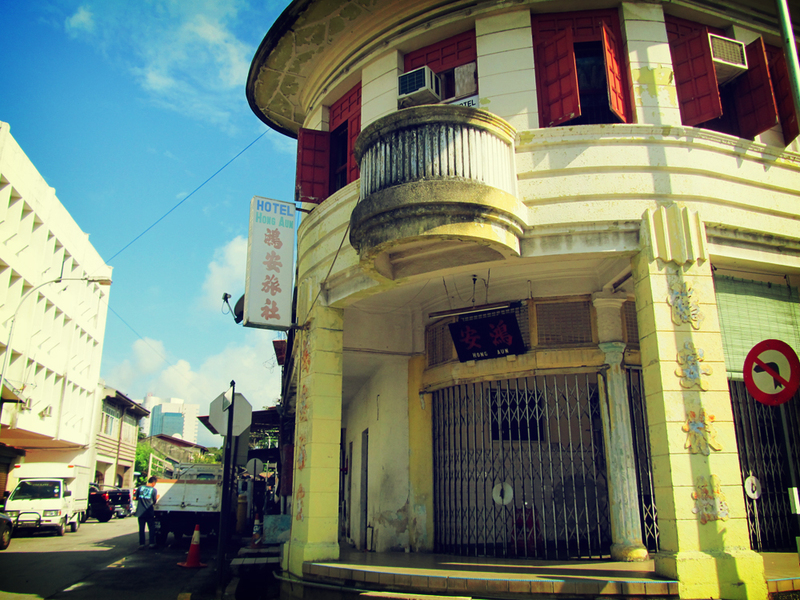 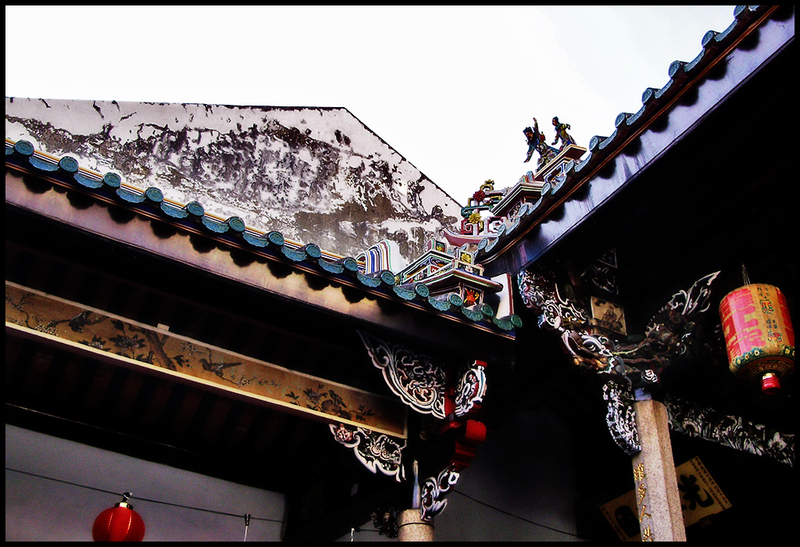 It is the community temple of the Penang Teochew Association. 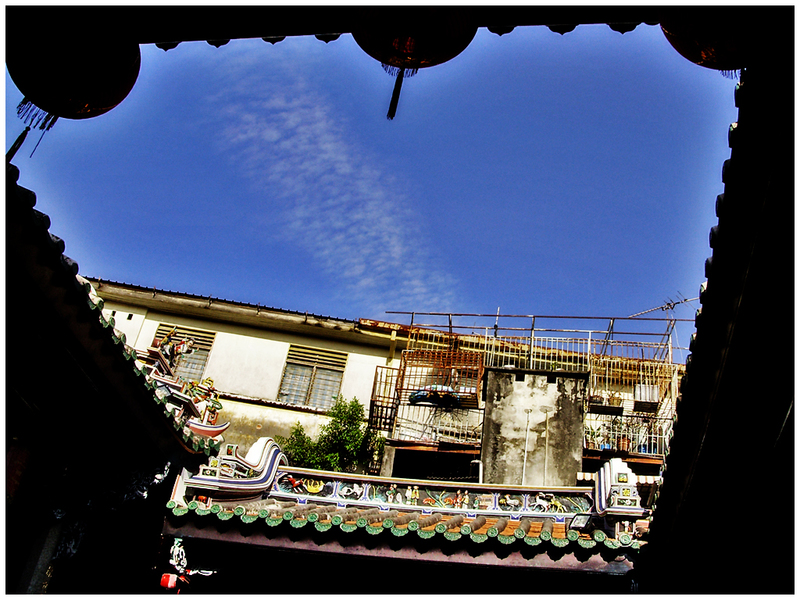 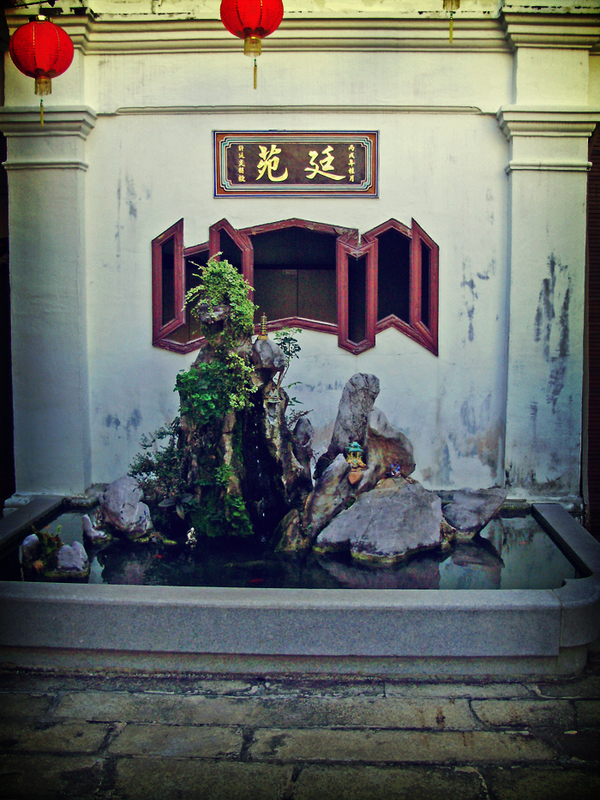 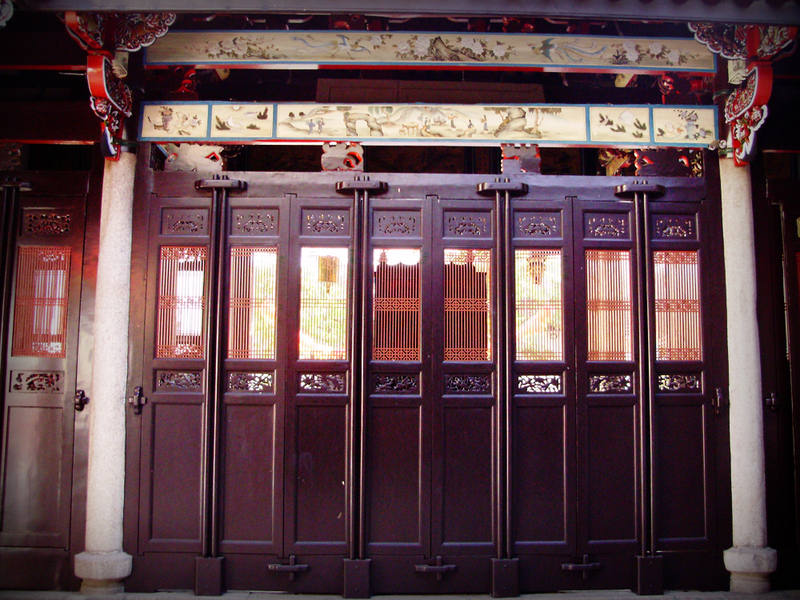 Completed in 1870, the Hanjiang Ancestral Temple is the community temple of the Penang Teochew Association which was formed in 1855 by six Teochew migrants. 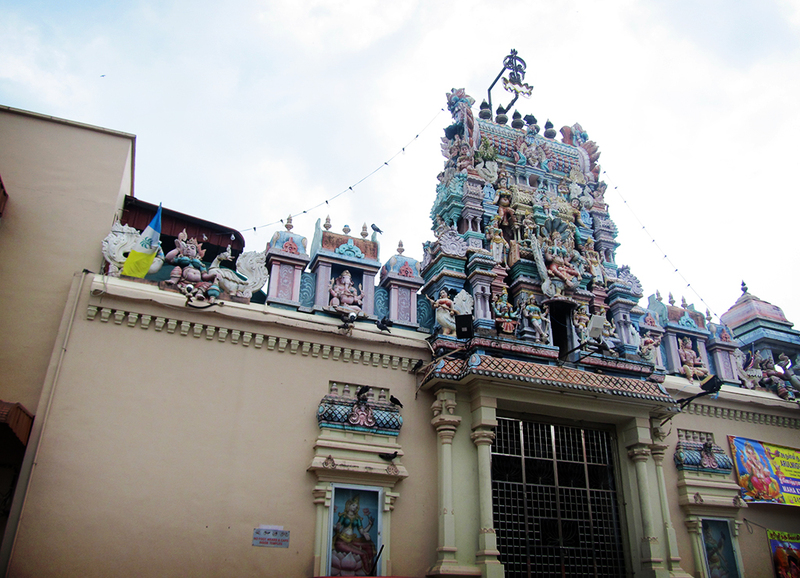 The temple has suffered from long years of wear and tear as well as neglect over the year until a special committee was then formed in 2002 to conduct a restoration project of the temple which was later completed in 2005. 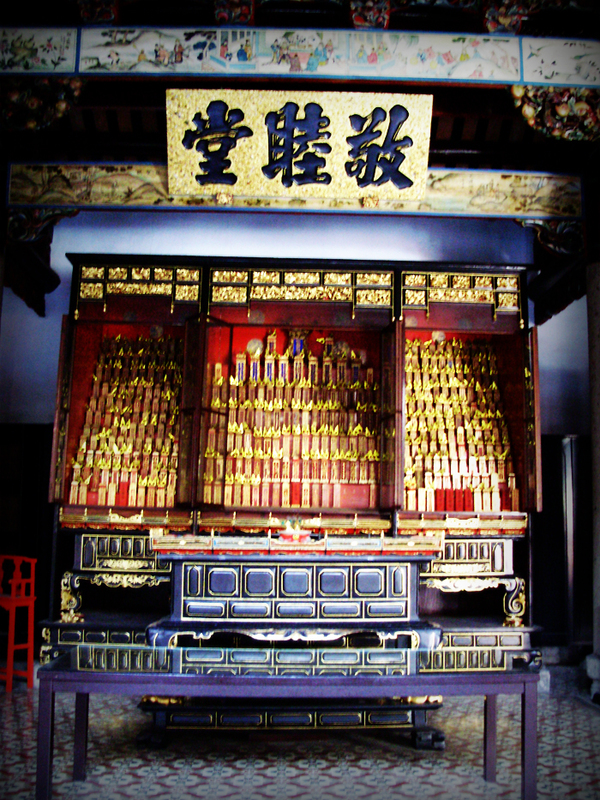 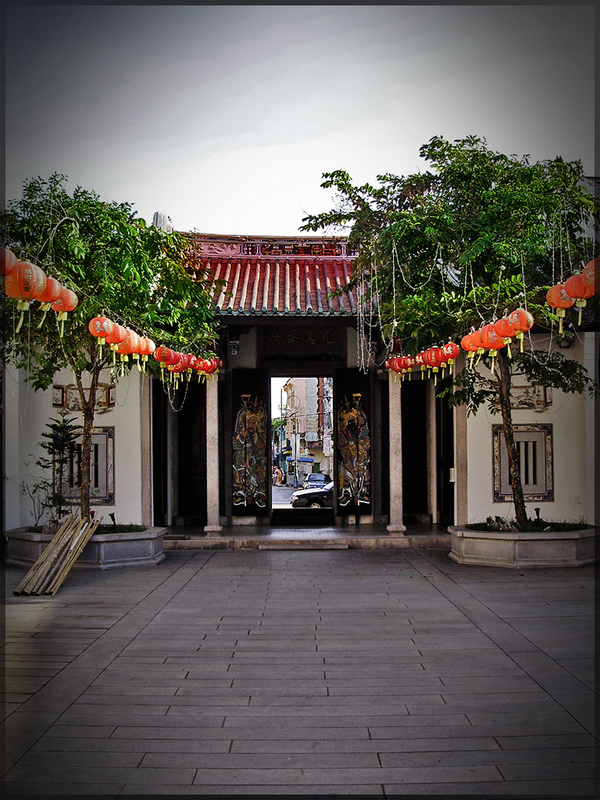 The temple is carefully restored in its unique old Chinese architecture and to reflect its history properly. 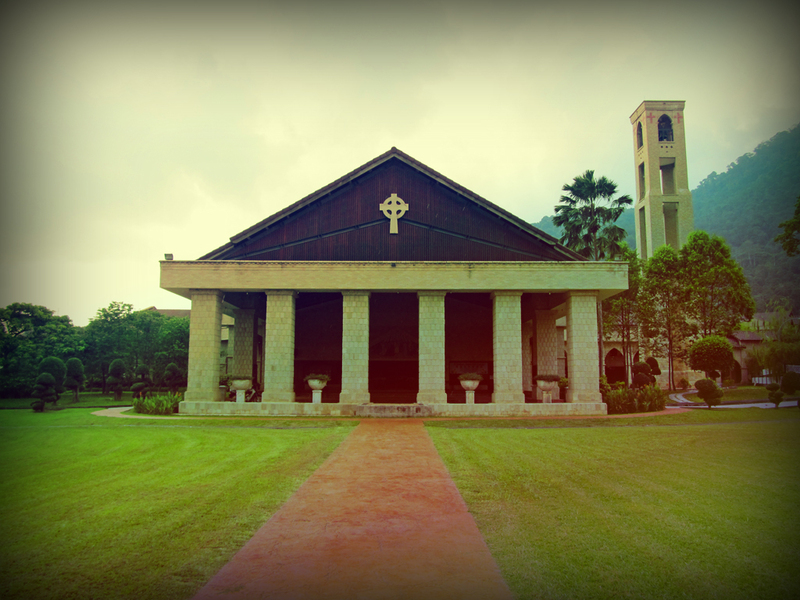 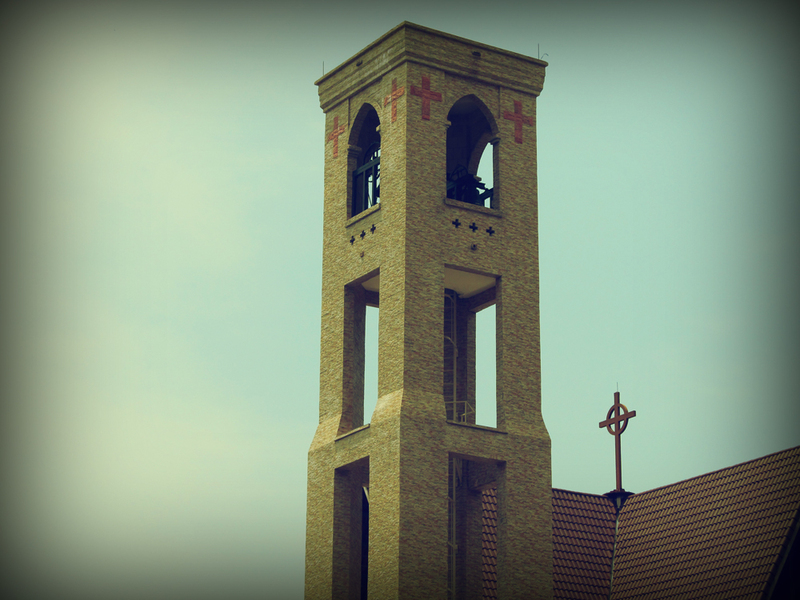 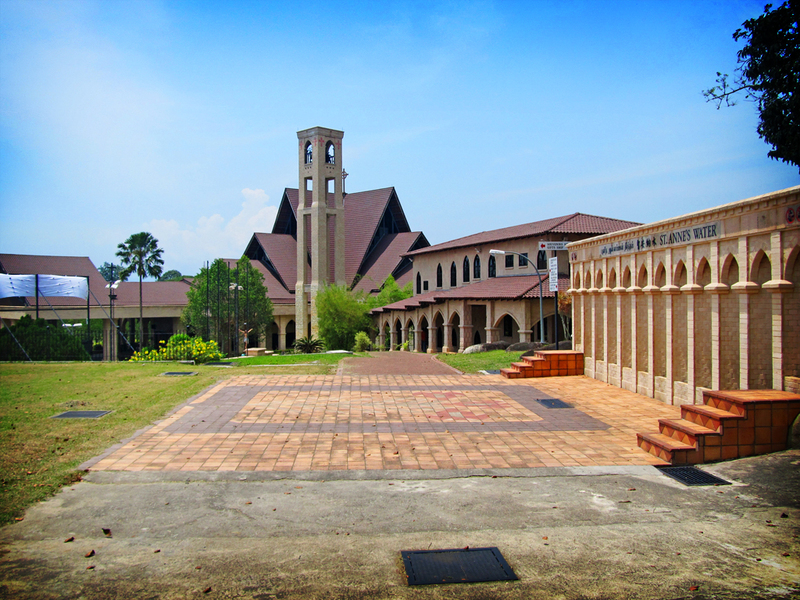 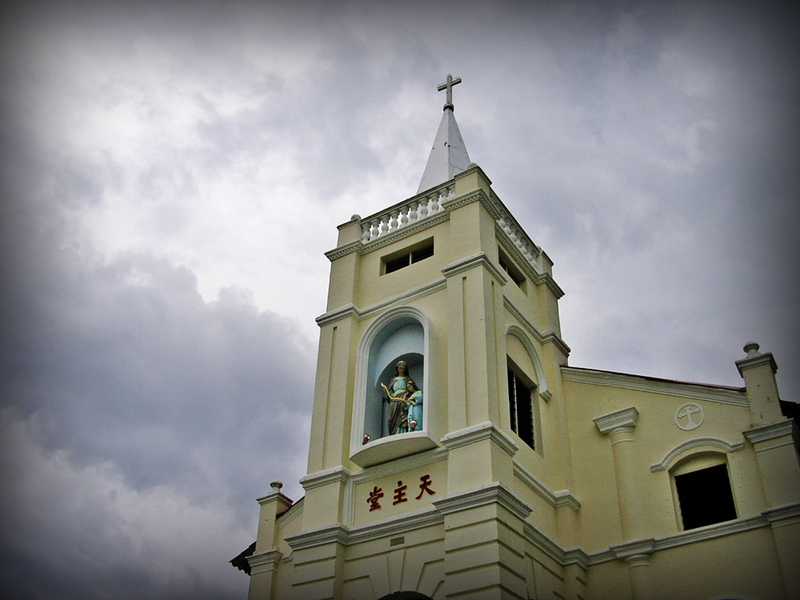 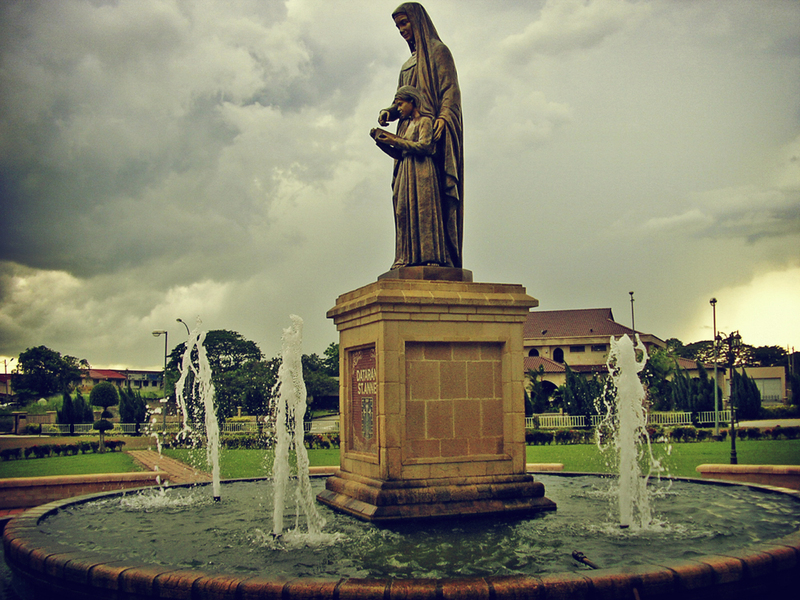 The famous St. Anne Church is located at a 20-acres land in Bukit Mertajam, Penang. 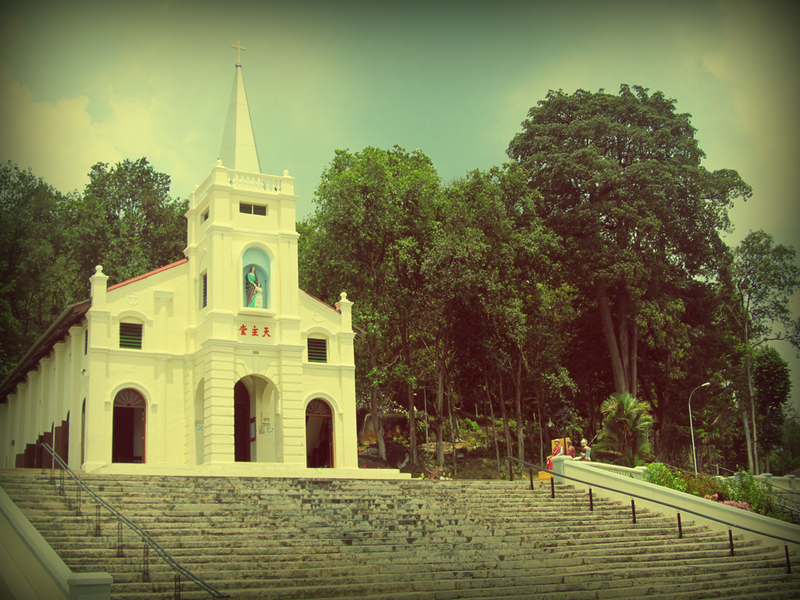 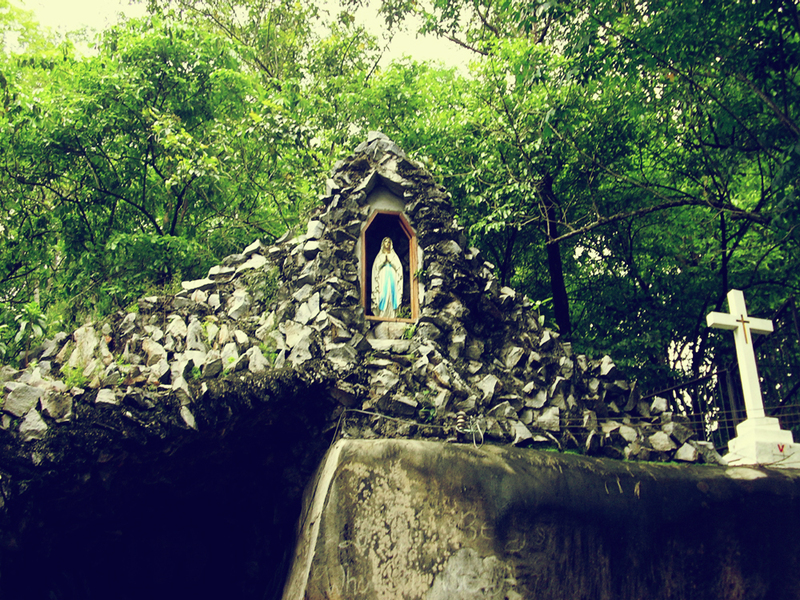 The Roman Catholic church was founded in 1846 and its first chapel was built on top of the hill. 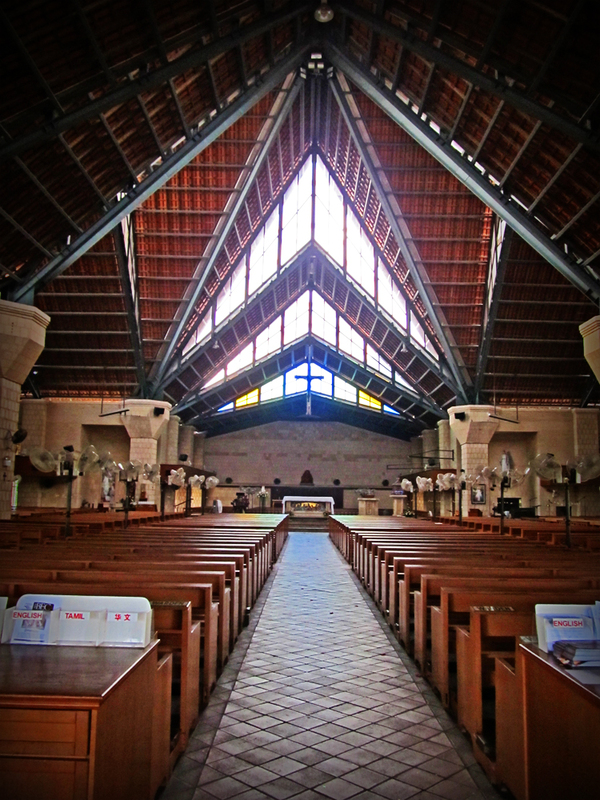 The church expanded as years passed with an increase of Catholic populations in the state, with major developments during the 1990s to 2000s. 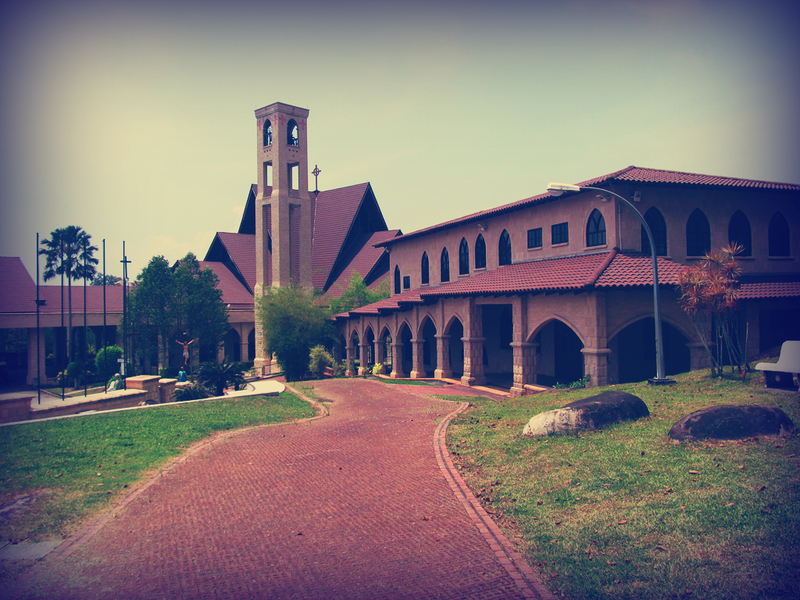 In 2002, another new church was built which is one of the largest churches in Malaysia. 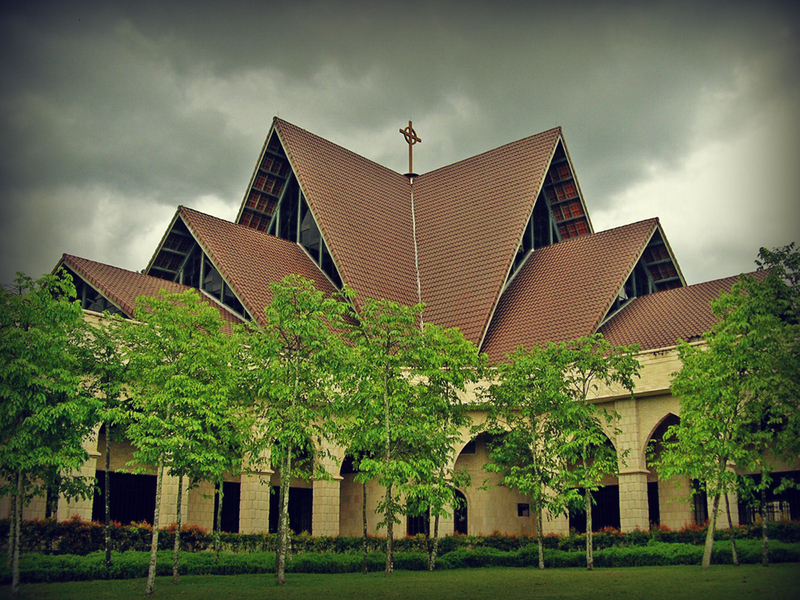 The church was built incorporating Minangkabau element such as its roofs. 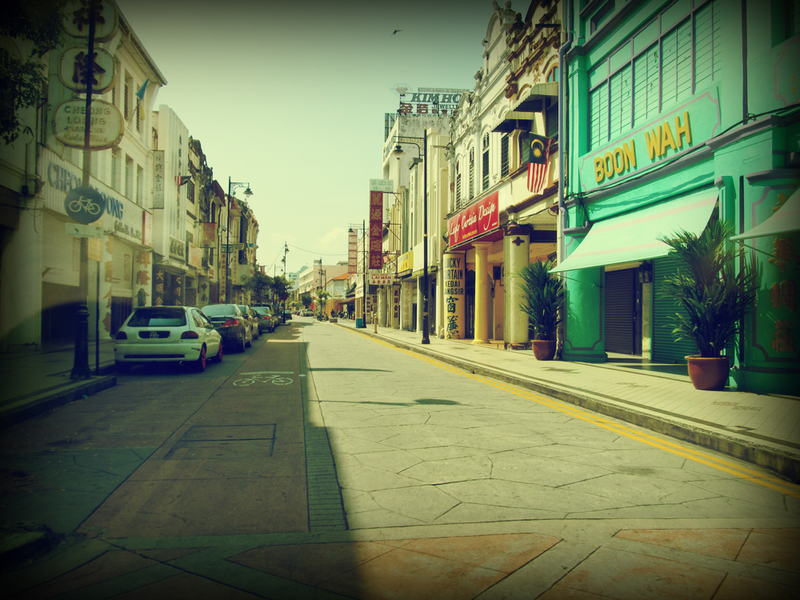 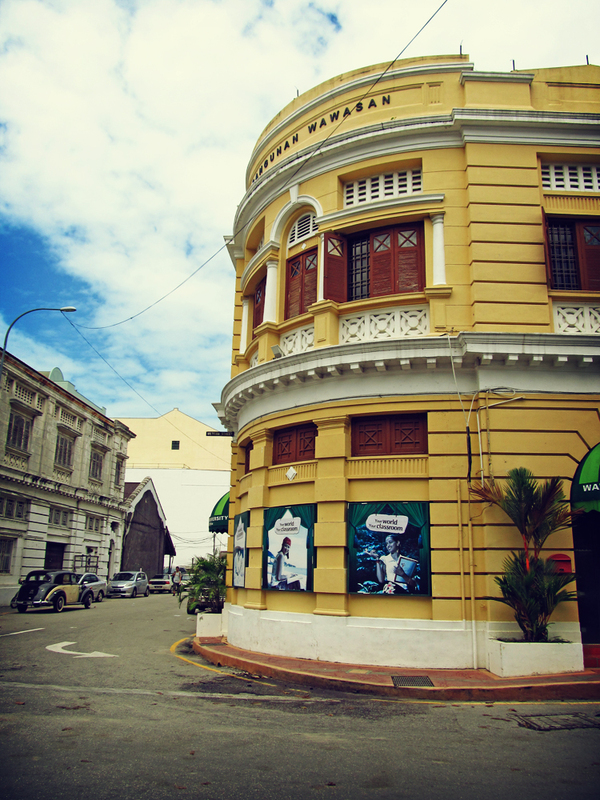 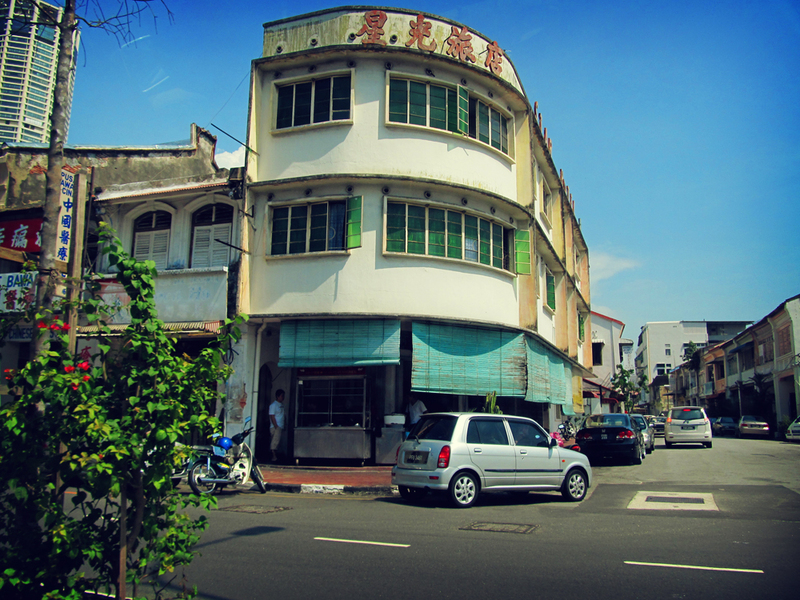 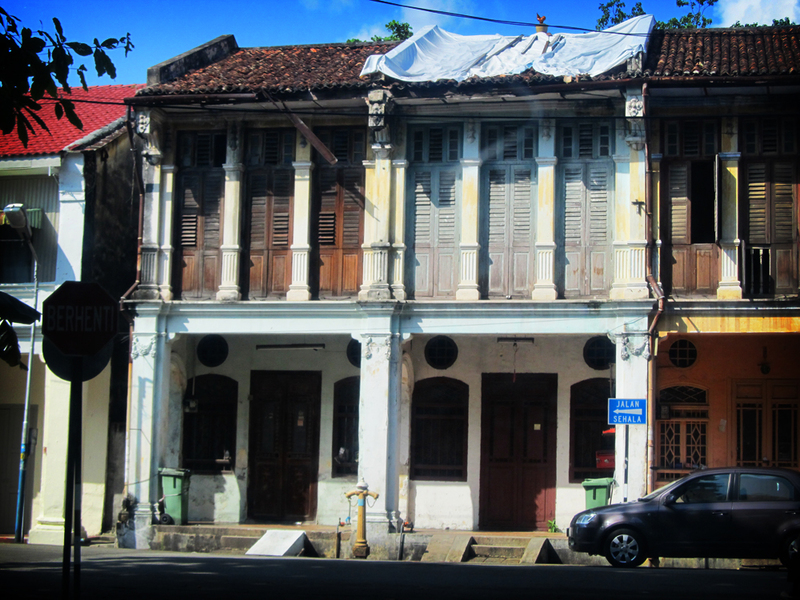 An avenue named Dataran St. Anne was also constructed in front of the church. 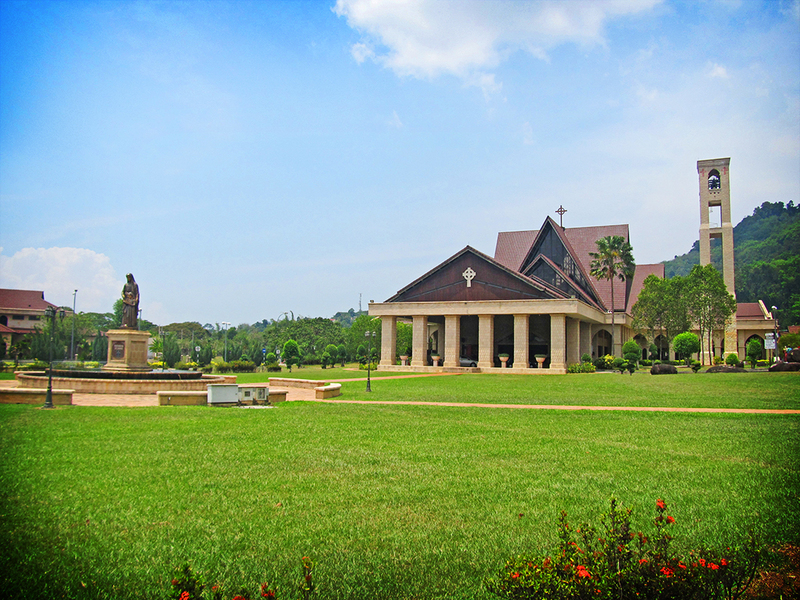 Various facilities were also built such as dormitories for visiting pilgrims, parish office, parish community centre and presbytery. 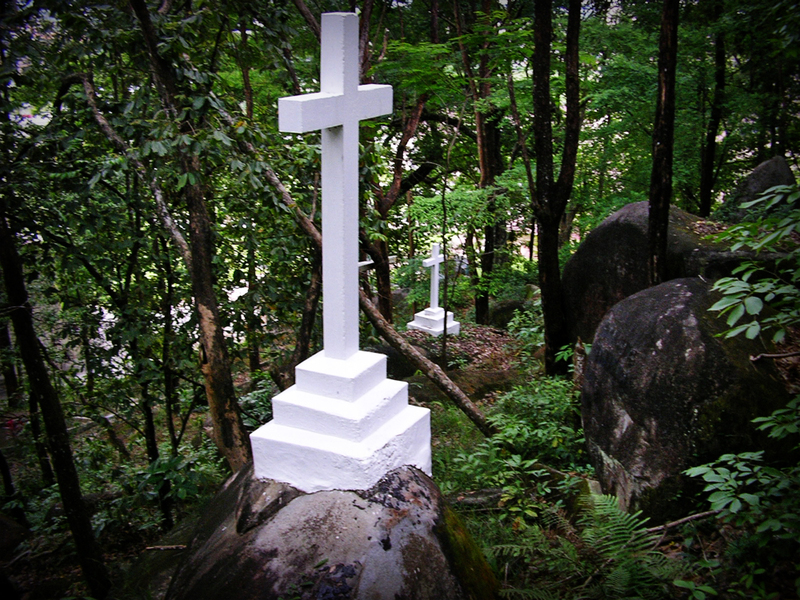 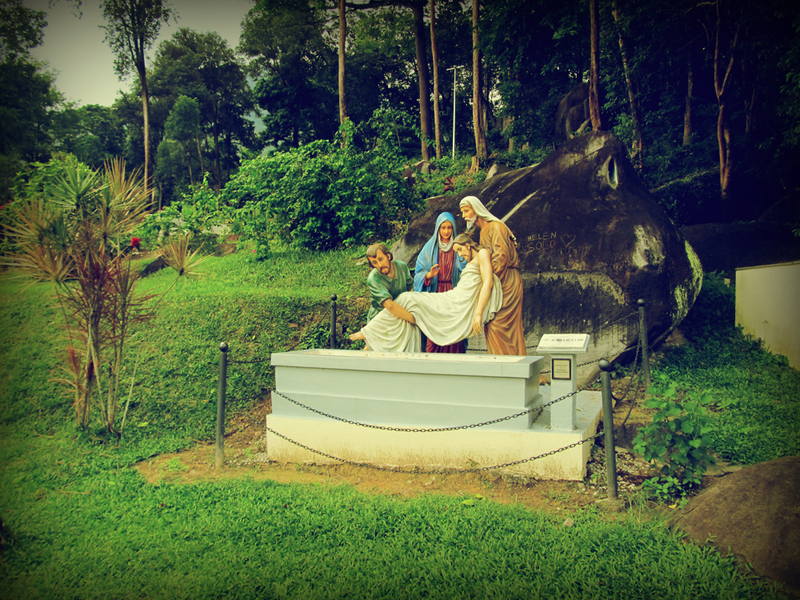 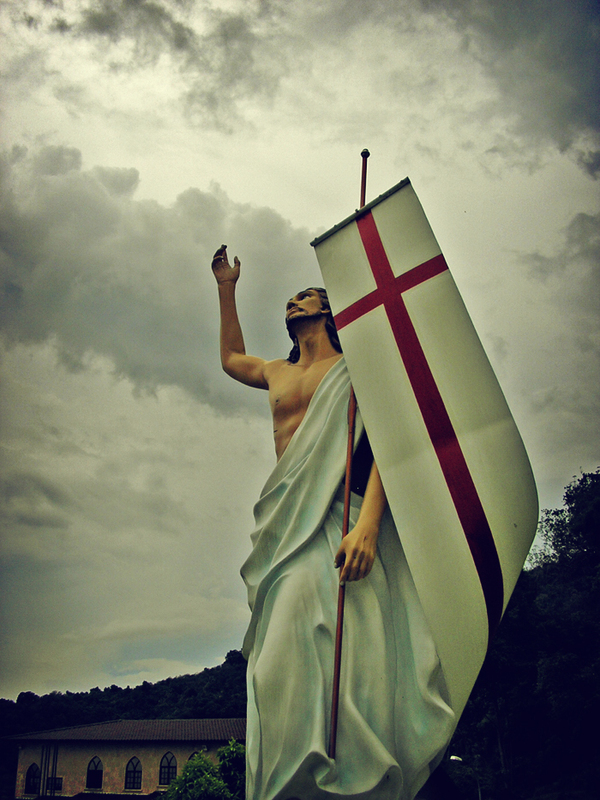 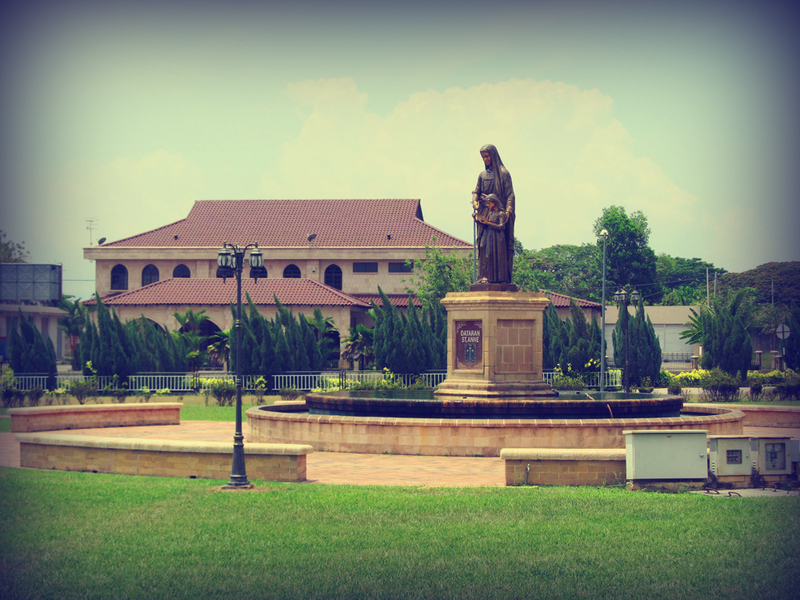 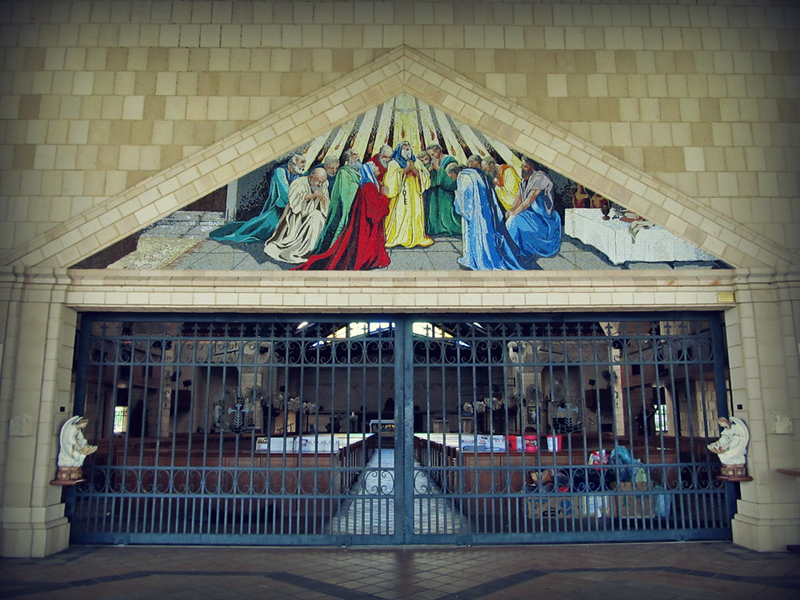 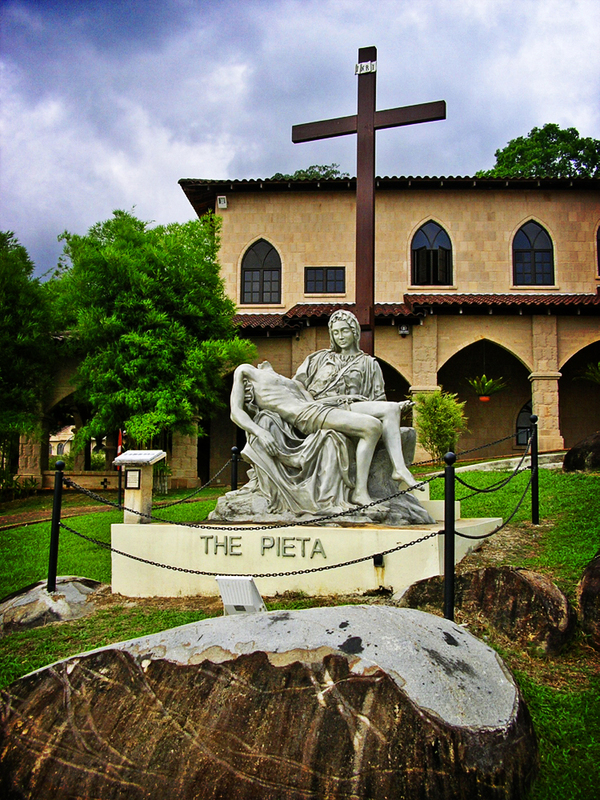 In 2006, the church installed the ‘Statues of Passion’ at a cost of RM600,000 depicting the stations of the cross. 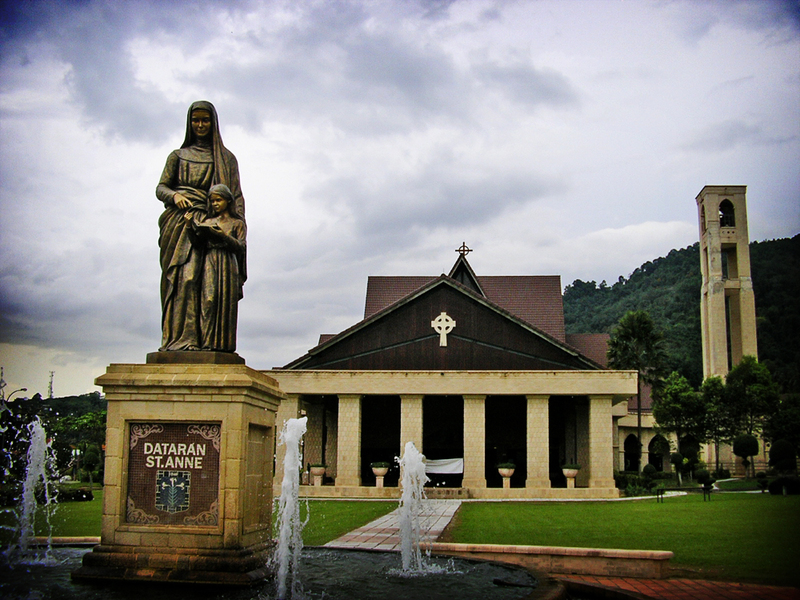 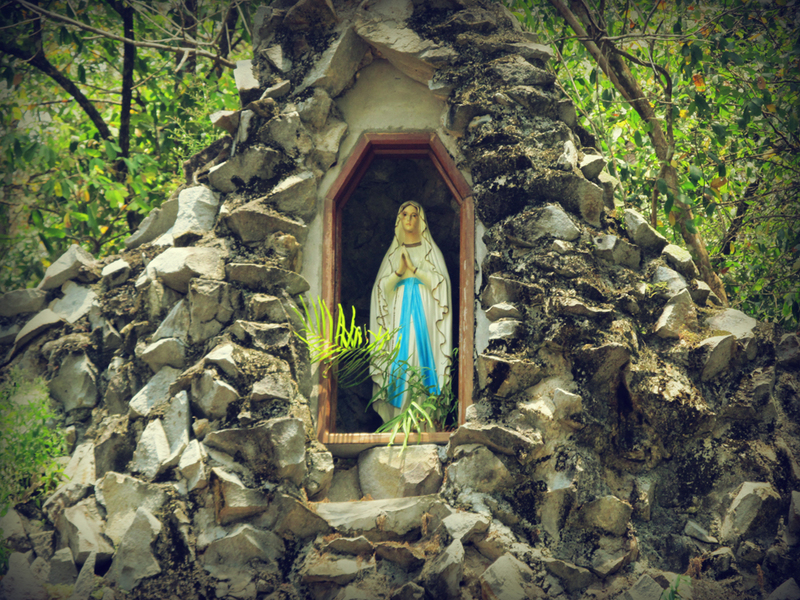 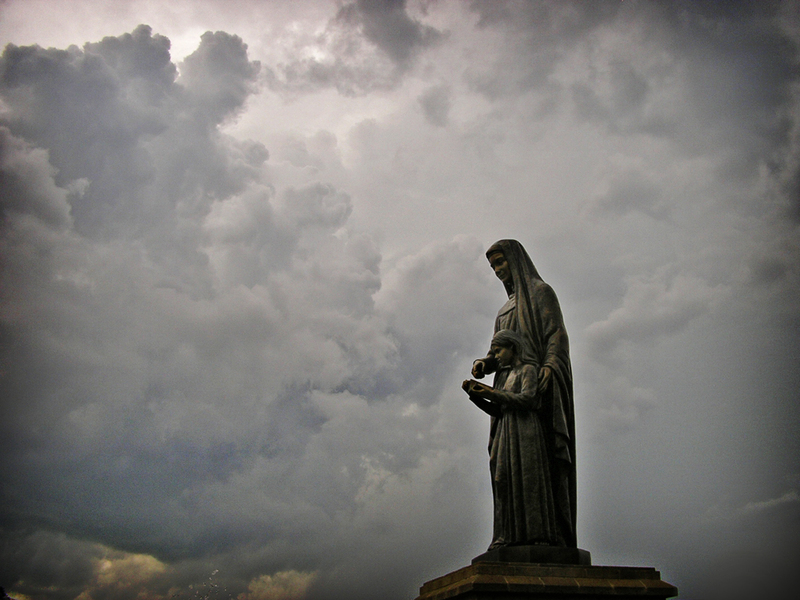 The real feast day of St Anne is on 26 July, but it is usually celebrated for ten days at Bukit Mertajam, either on the real day or immediately after the real day. 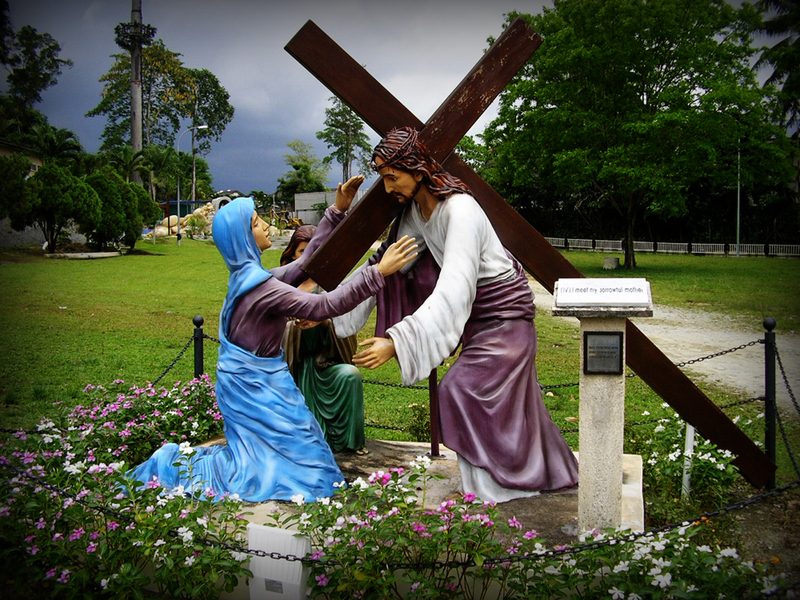 The celebrations include a candlelight procession, a nine-day novena and adoration of the Blessed Sacrament. 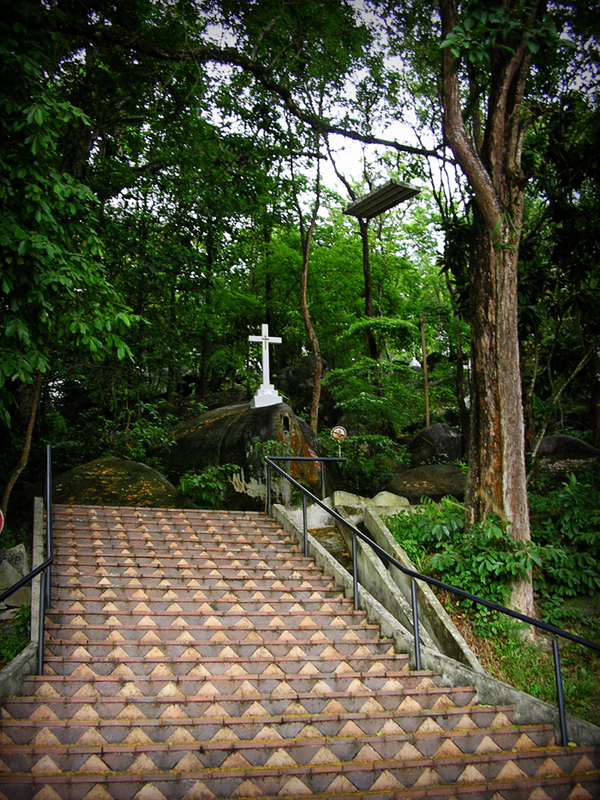 During these days, pilgrims from all over the country, including neighboring countries, will be travelling here. 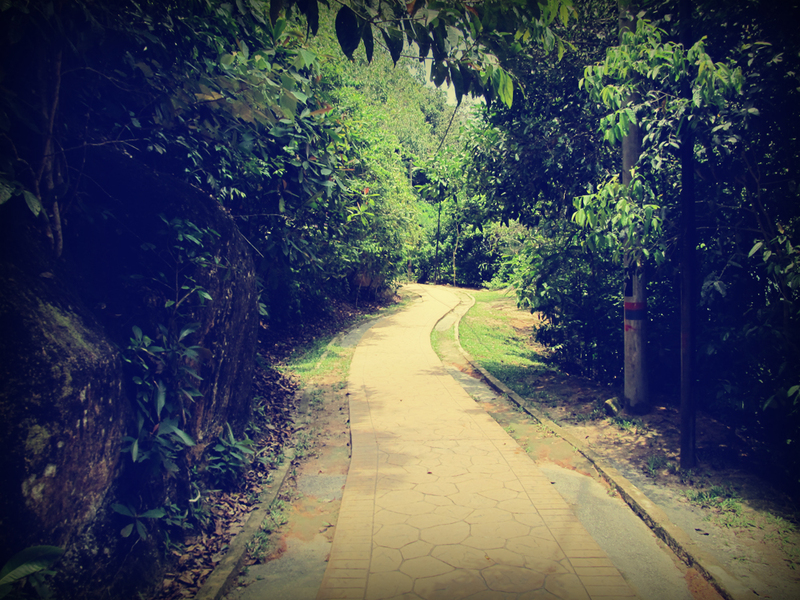 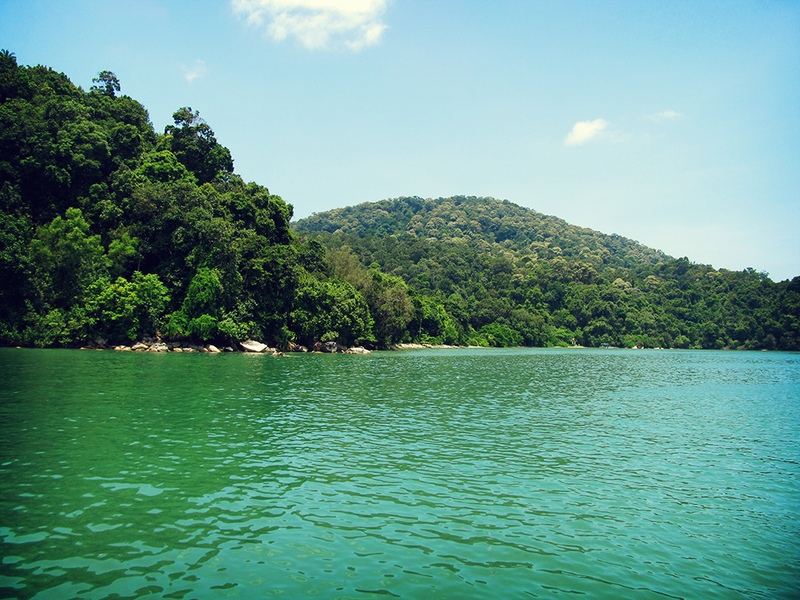 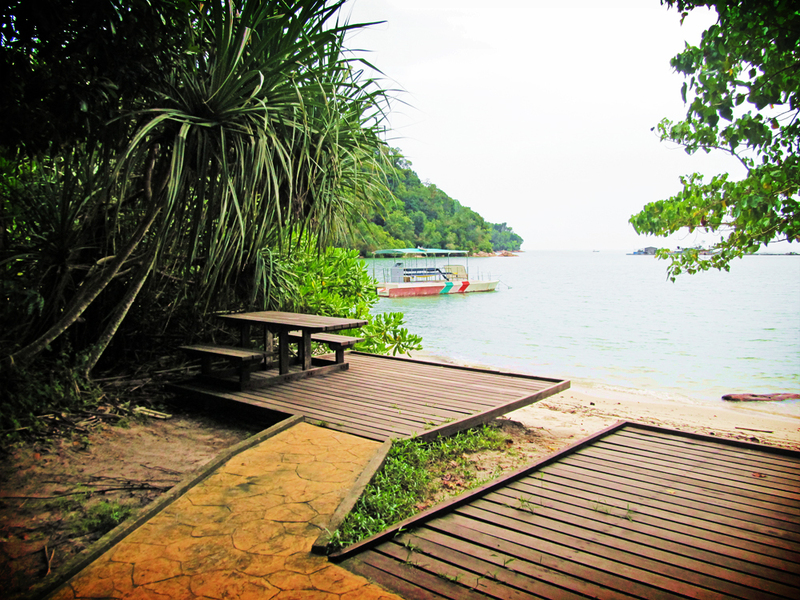 The Penang National Park located at Teluk Bahang (or sometimes referred locally as ‘End of the World’) is the first protected area legally gazetted under the National Park Act of 1980, which signifies the State and Federal Governments’ efforts in protecting the environment. 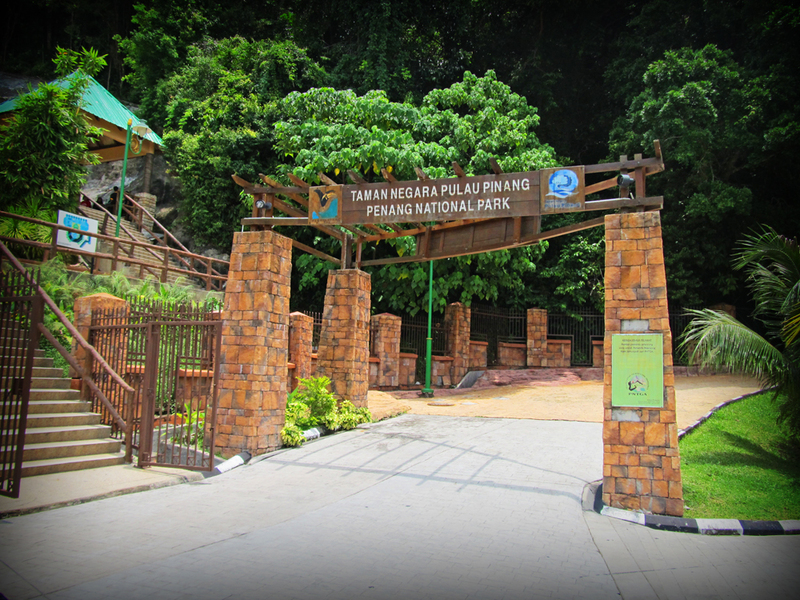 Also the smallest national park in the country, the park is unique due to its landscapes, wildlife and beaches. 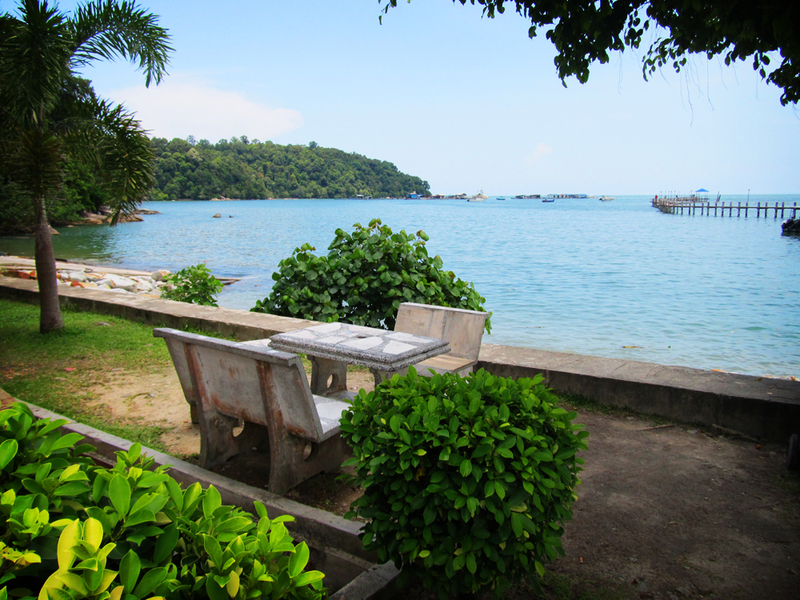 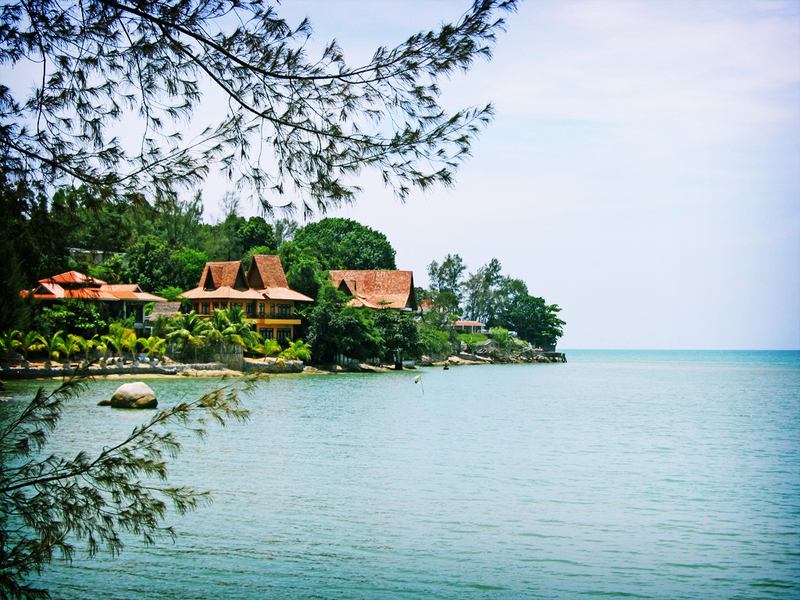 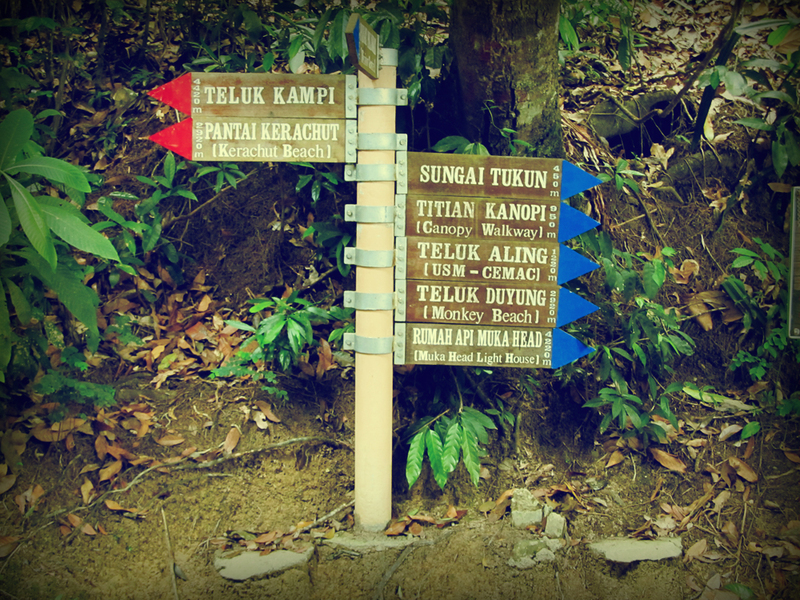 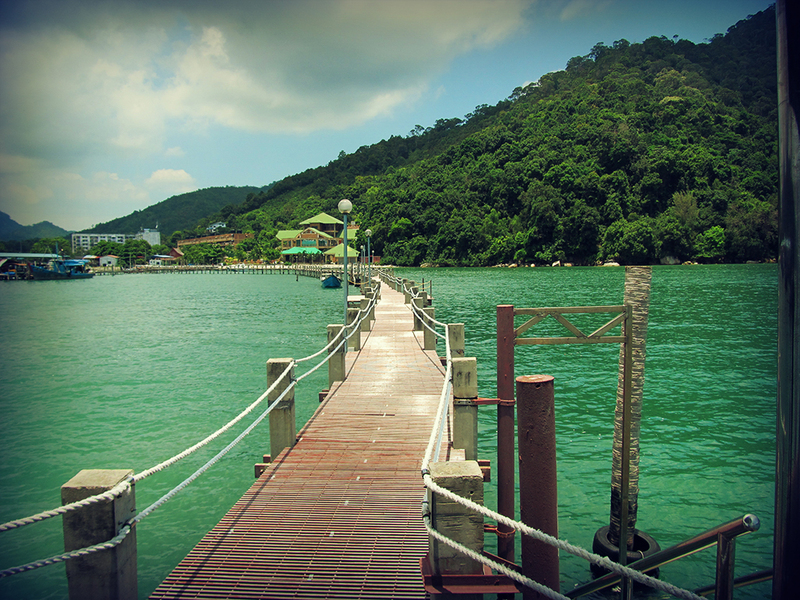 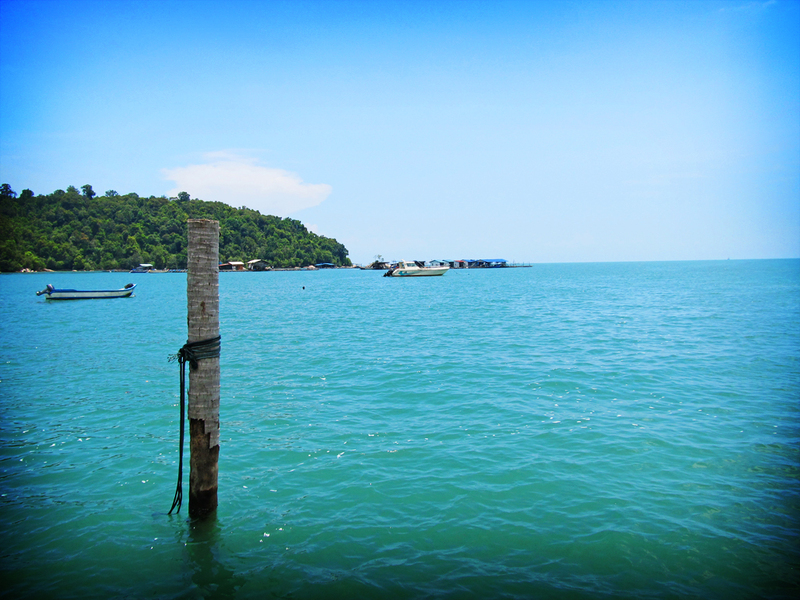 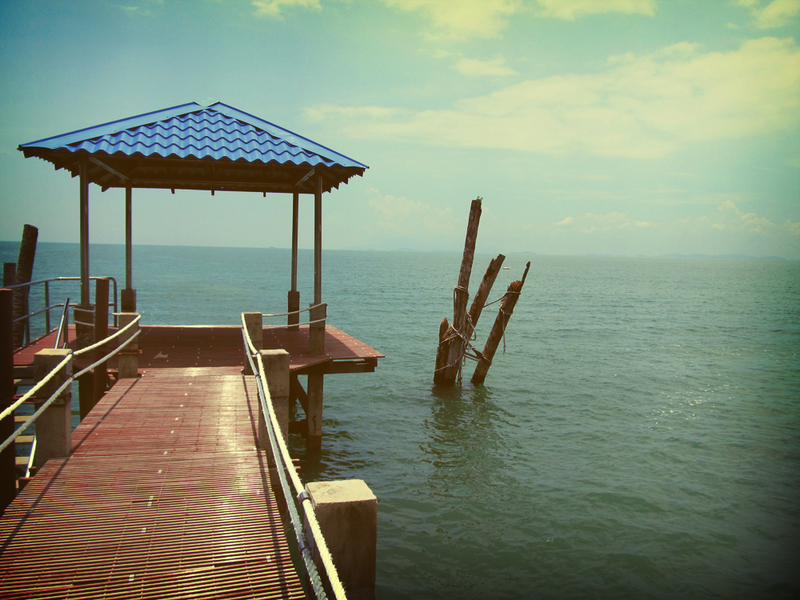 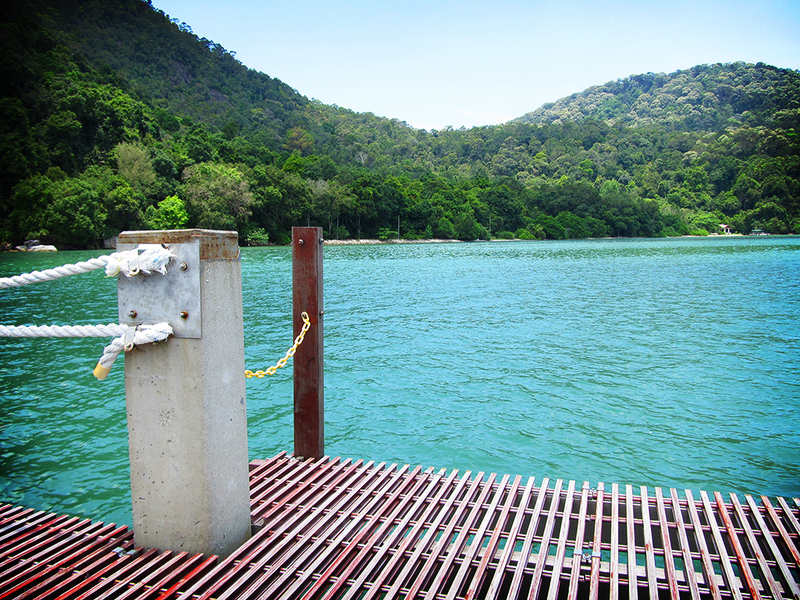 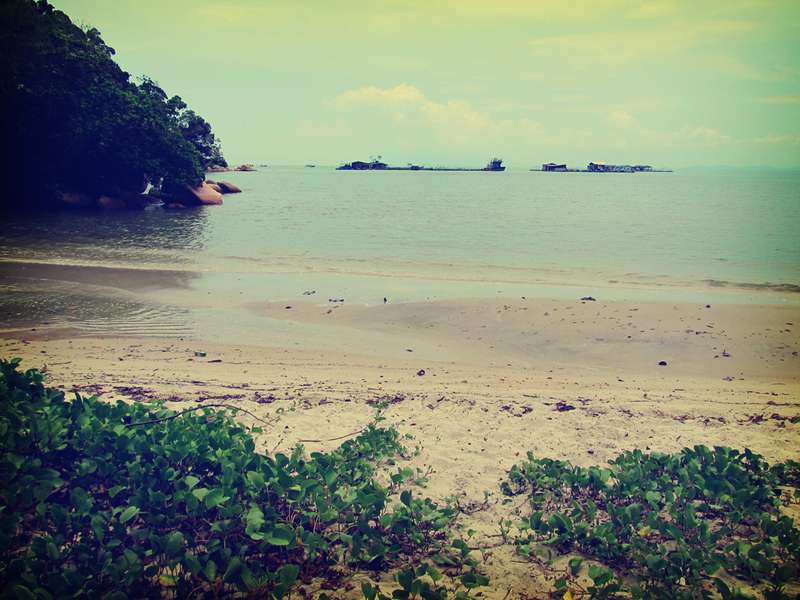 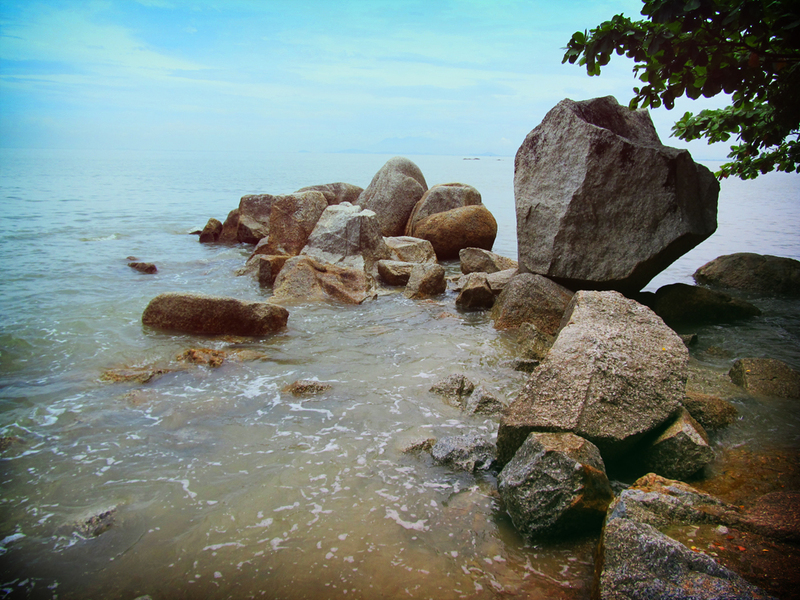 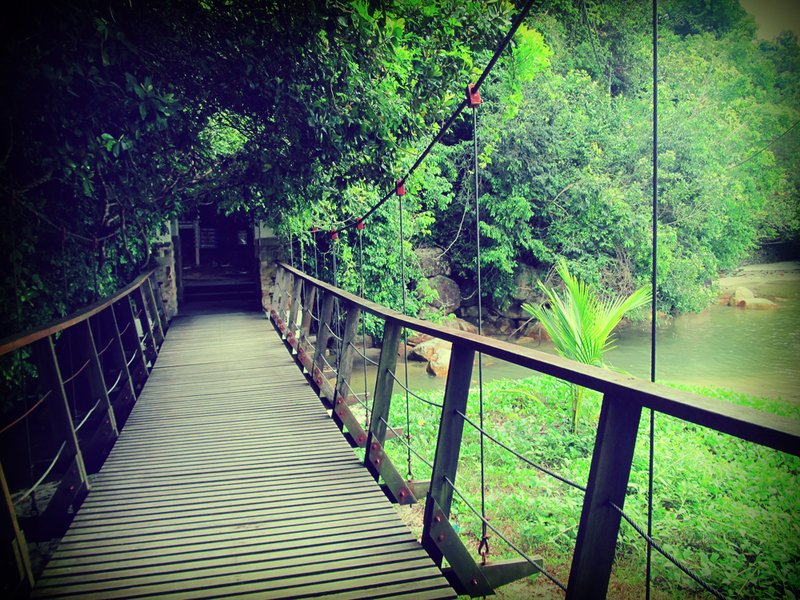 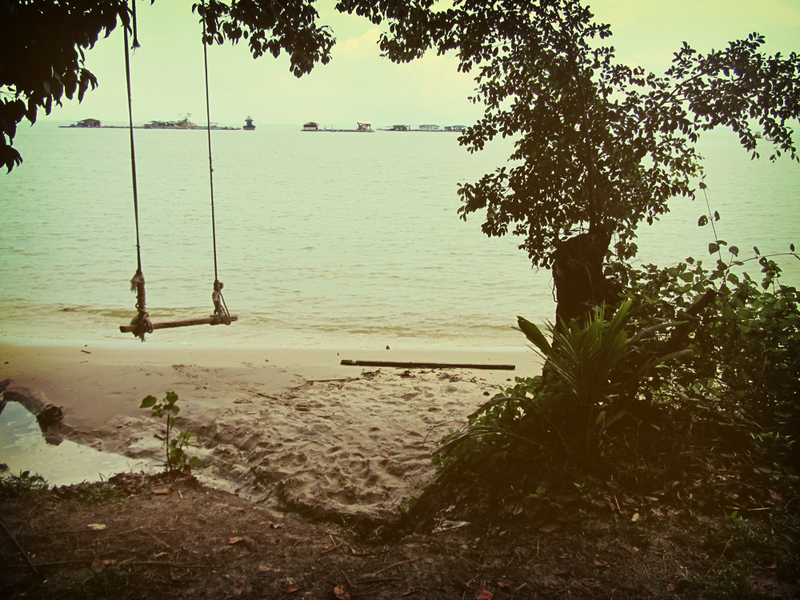 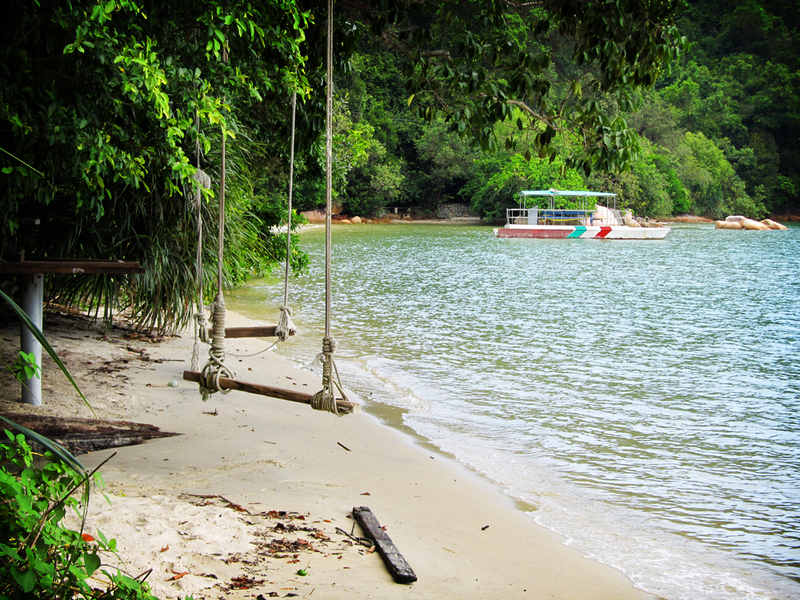 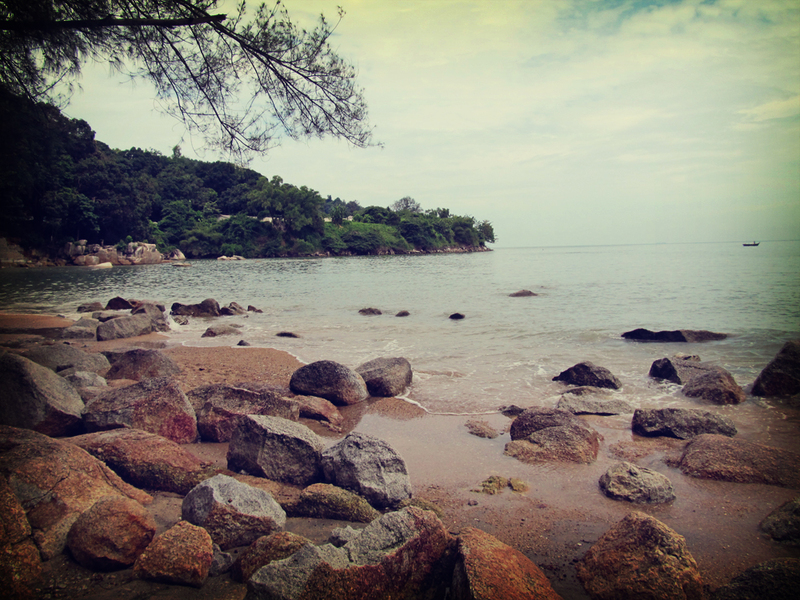 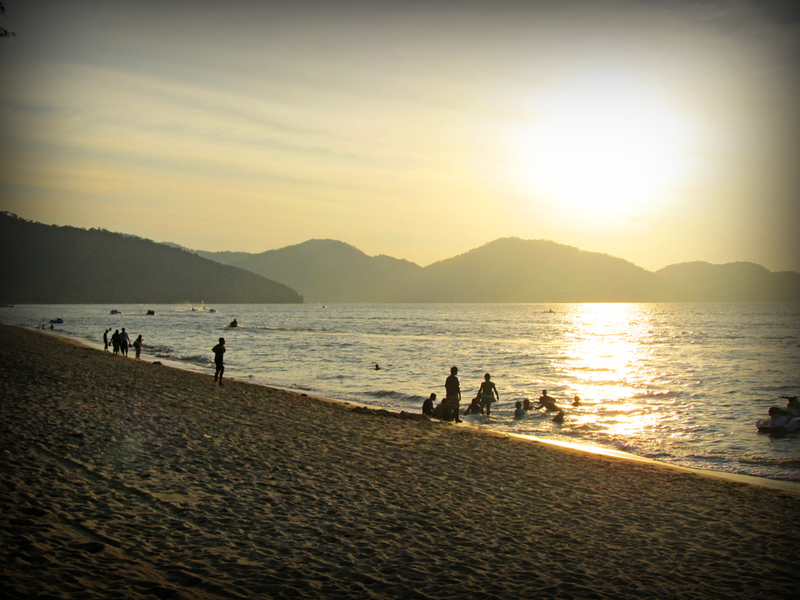 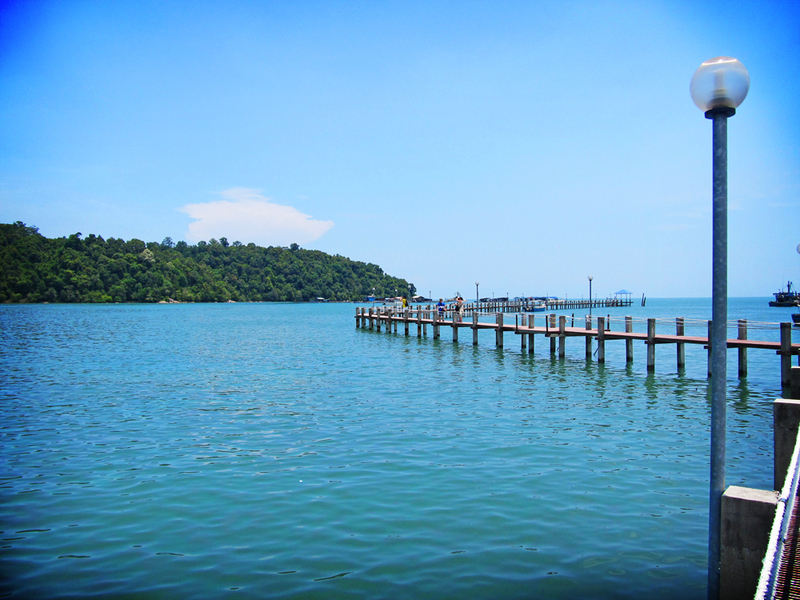 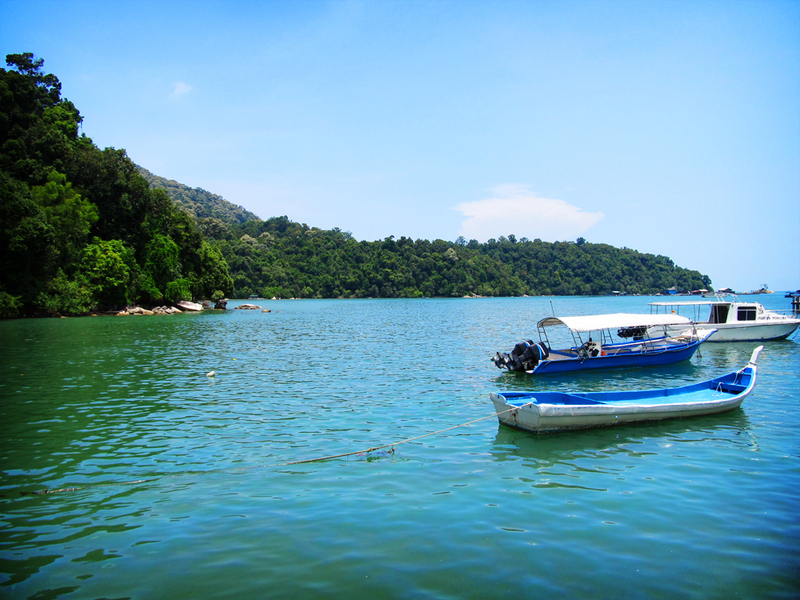 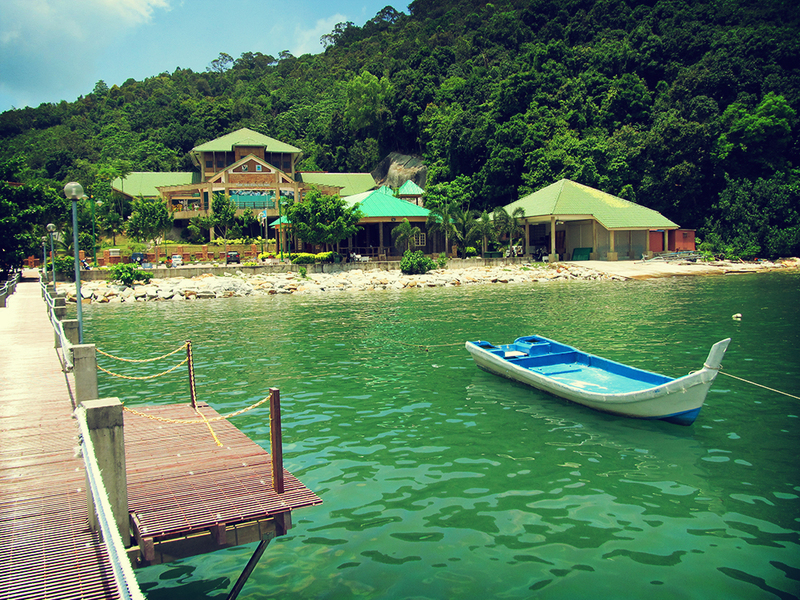 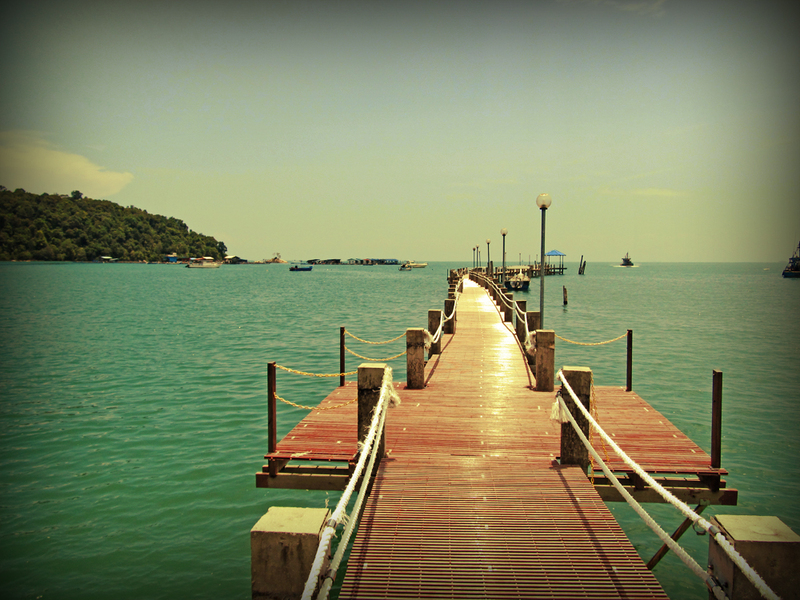 Teluk Bahang is a few kilometers further up from Batu Feringghi and the location of the National Forest is here. 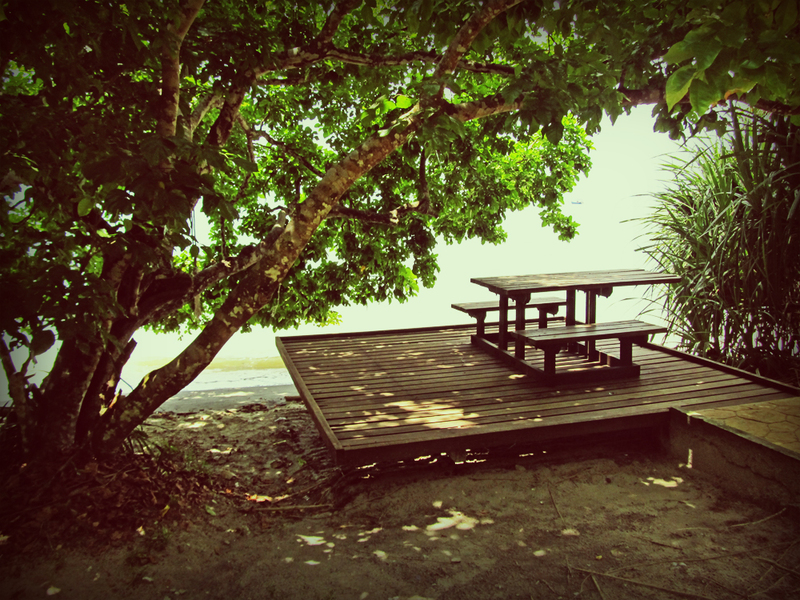 Some of the the unique features of the park include meromictic lake, wetlands, mangroves, mudflats, coral reefs and turtle nesting beaches. 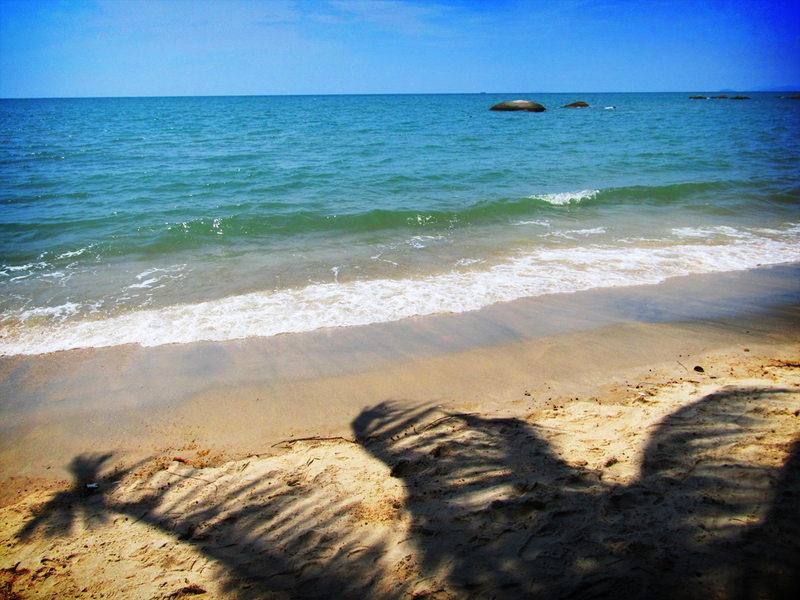 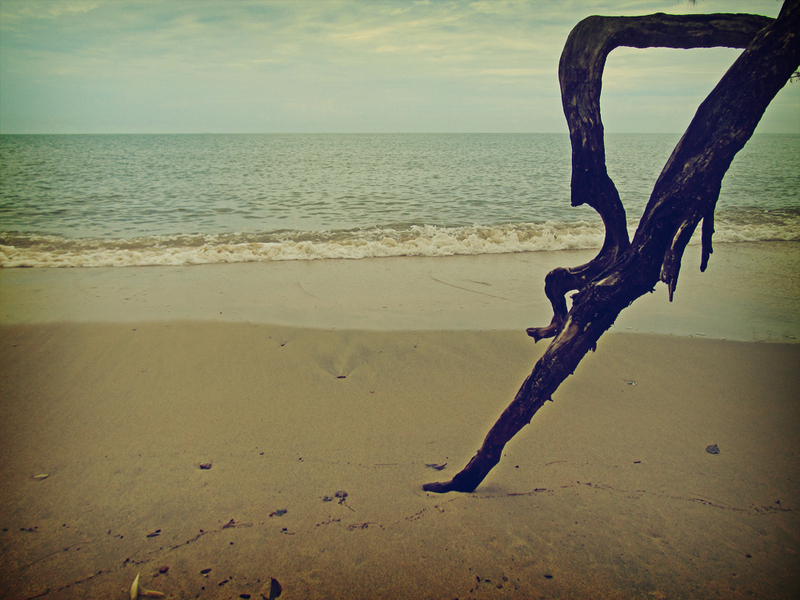 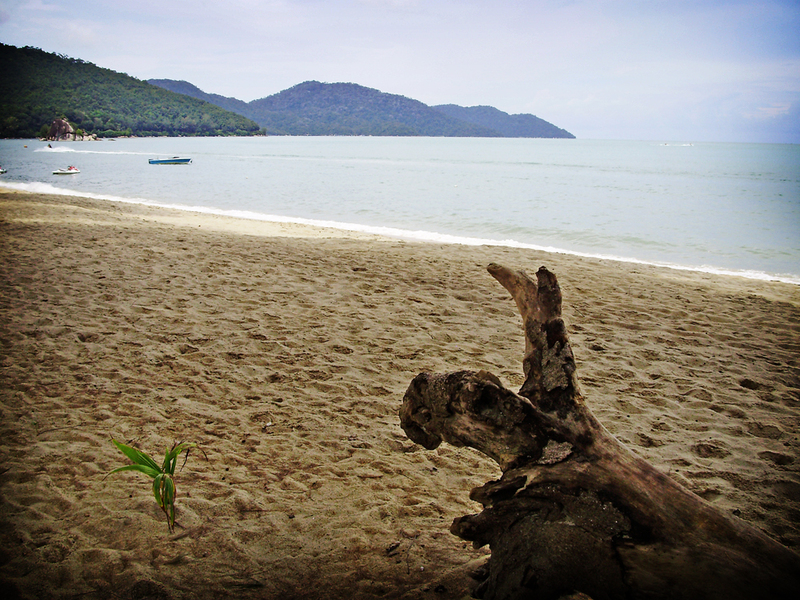 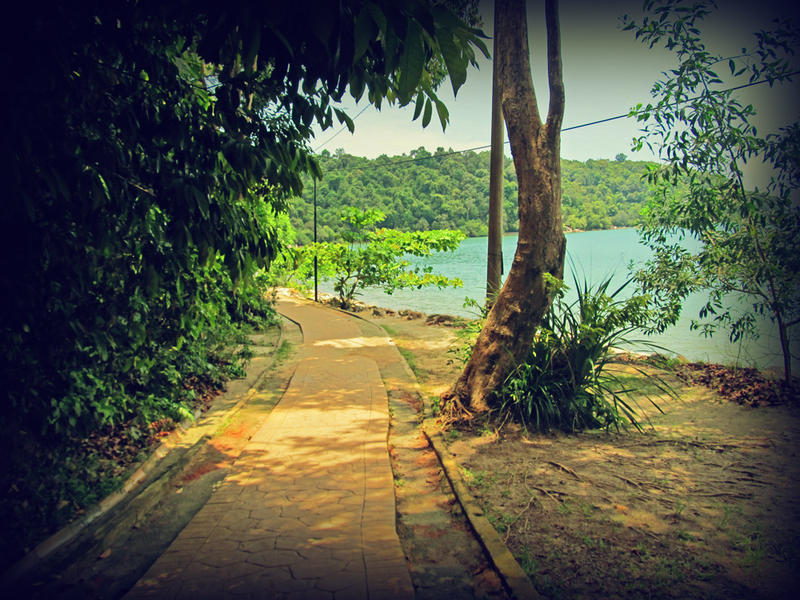 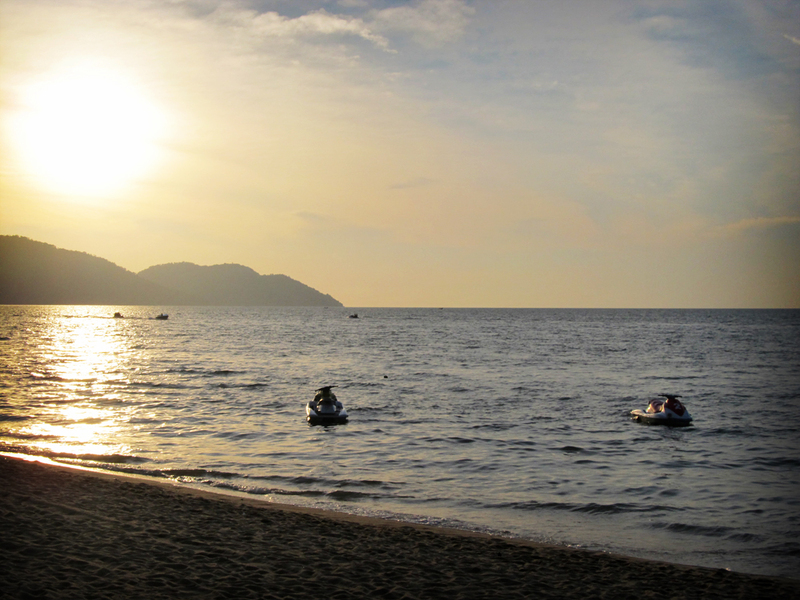 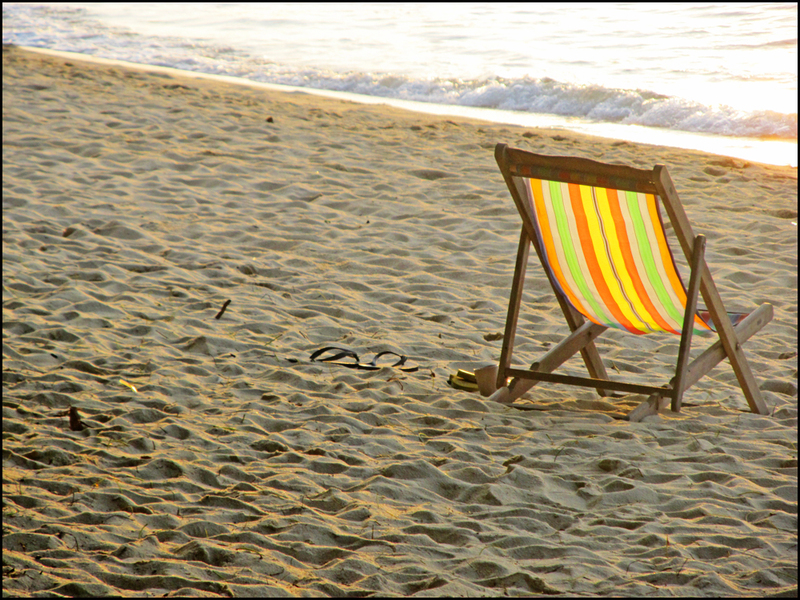 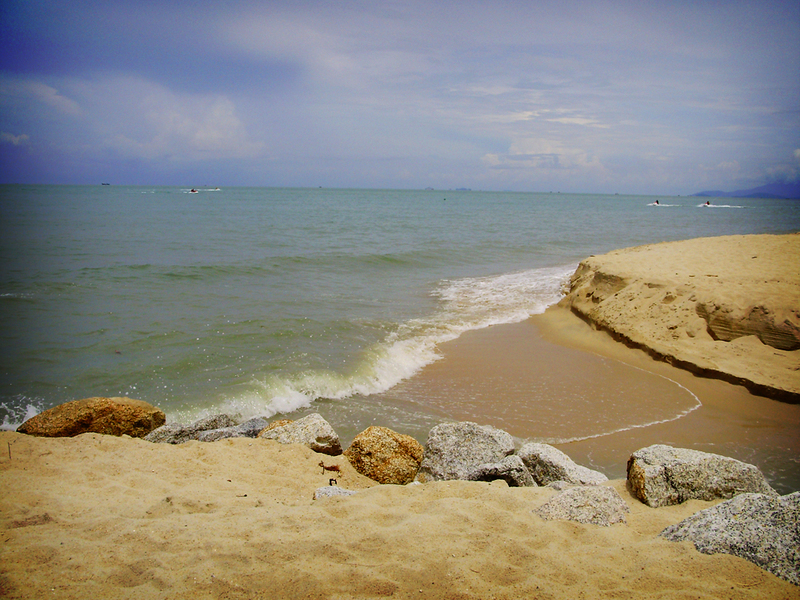 The eight beaches located at the park are among the nicest beaches in the island due to their almost untouched nature. 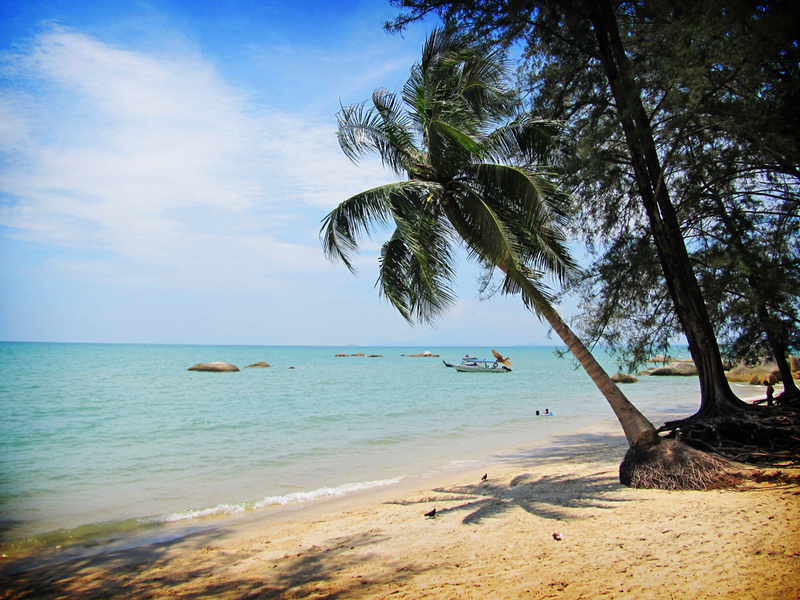 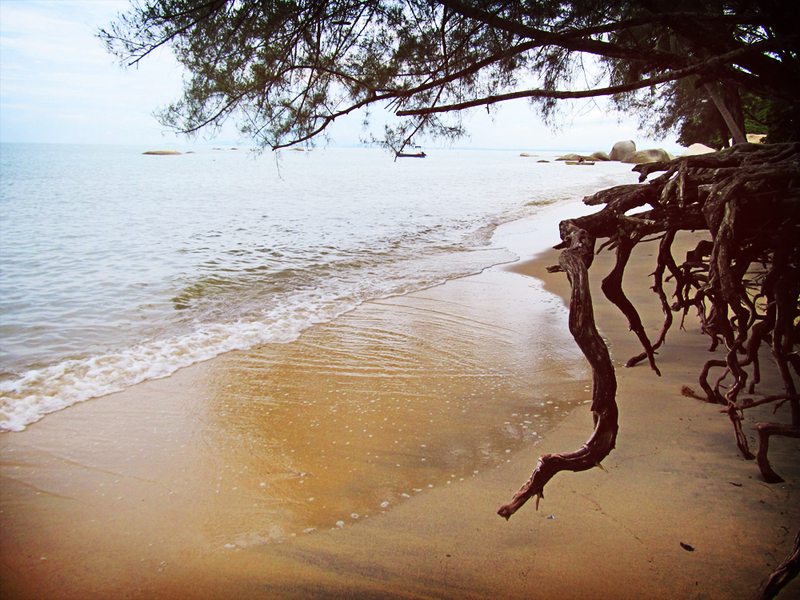 These beaches are Teluk Bahang, Teluk Tukun, Tanjung Aling, Teluk Duyung (Monkey Beach), Teluk Ketapang, Pantai Kerachut, Teluk Kampi and Pantai Mas. 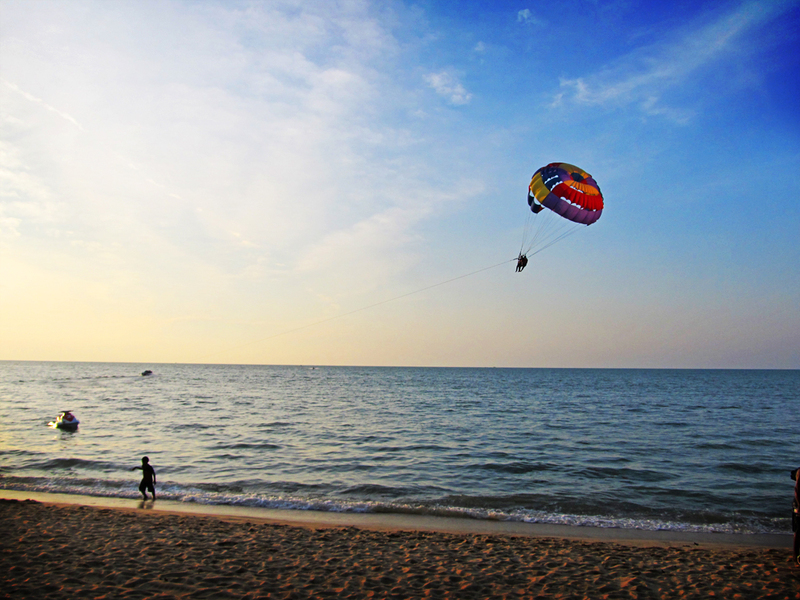 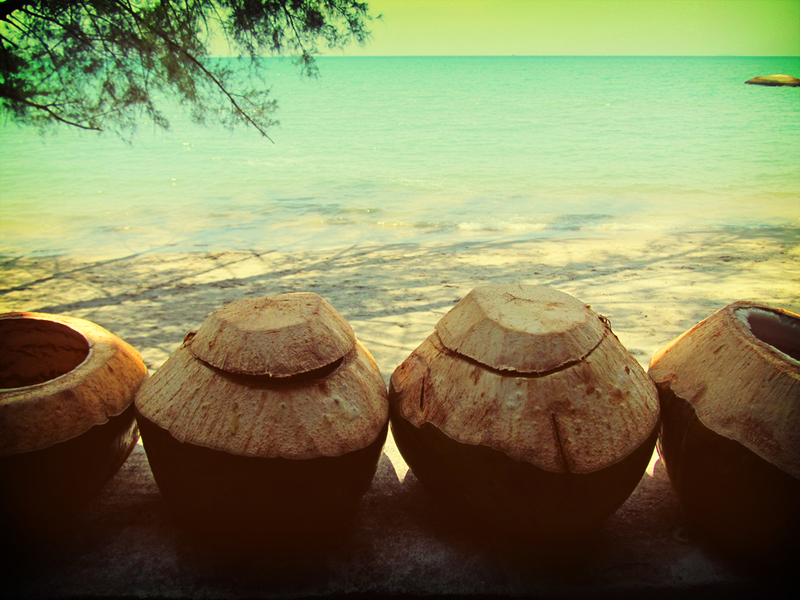 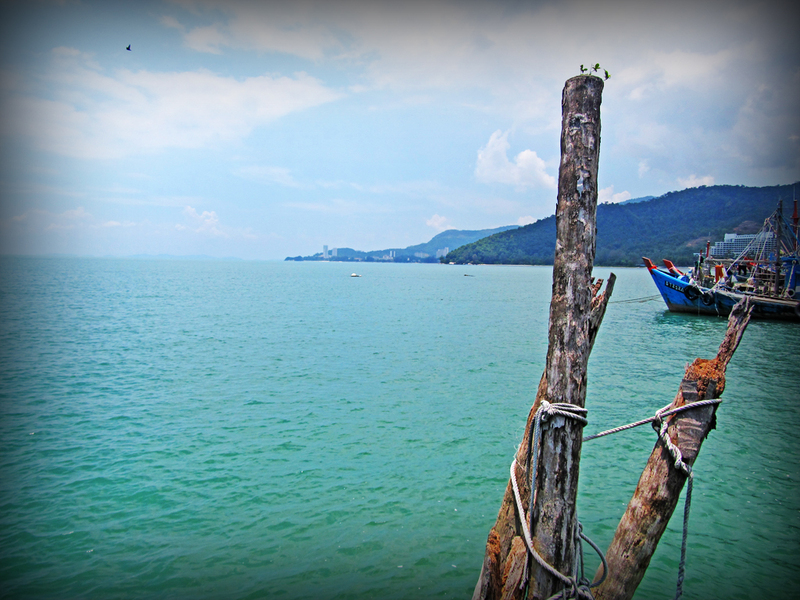 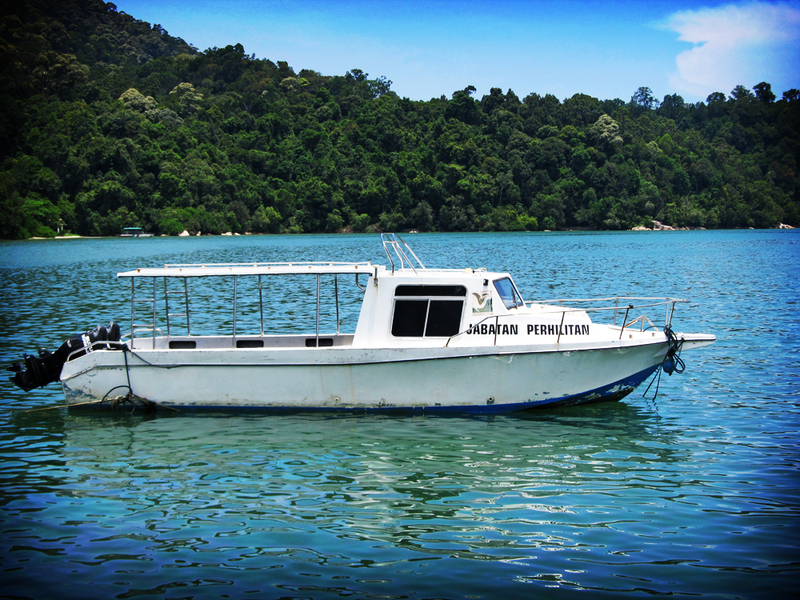 To get to the beaches, one can hike and walk up the jungle trails or alternatively hire a boat to reach there via the sea. 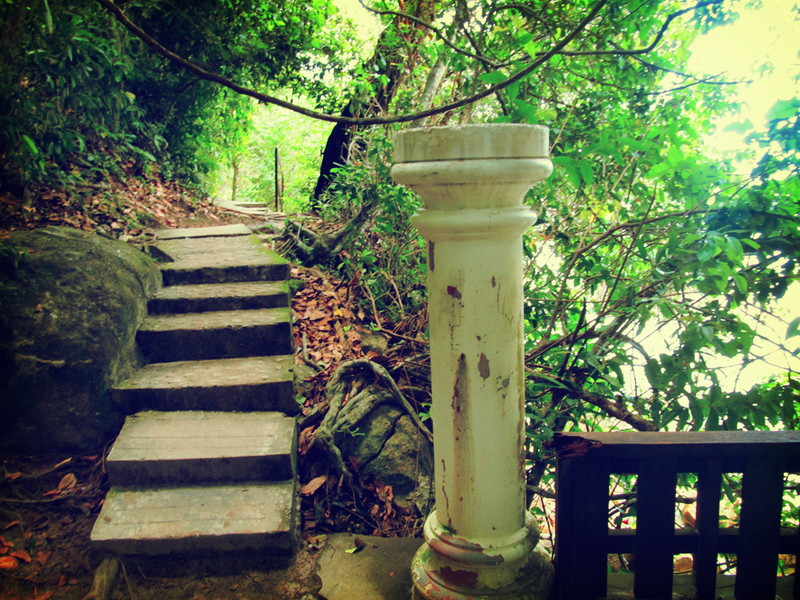 There is also a lighthouse in the park which is located at Muka Head and is accessible through the far end of Teluk Duyung. 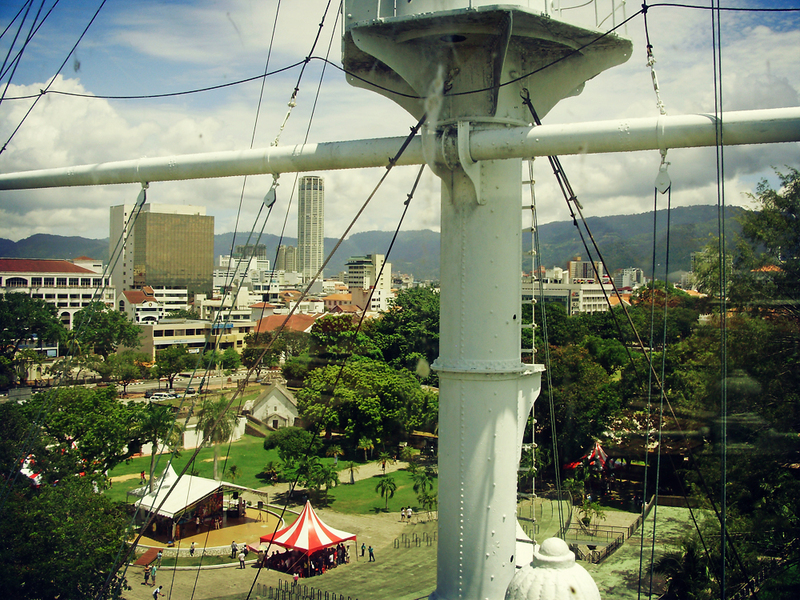 Built in 1883 at a cost of £37,929 by the British, it is located 242 metres (794 ft) above sea level. 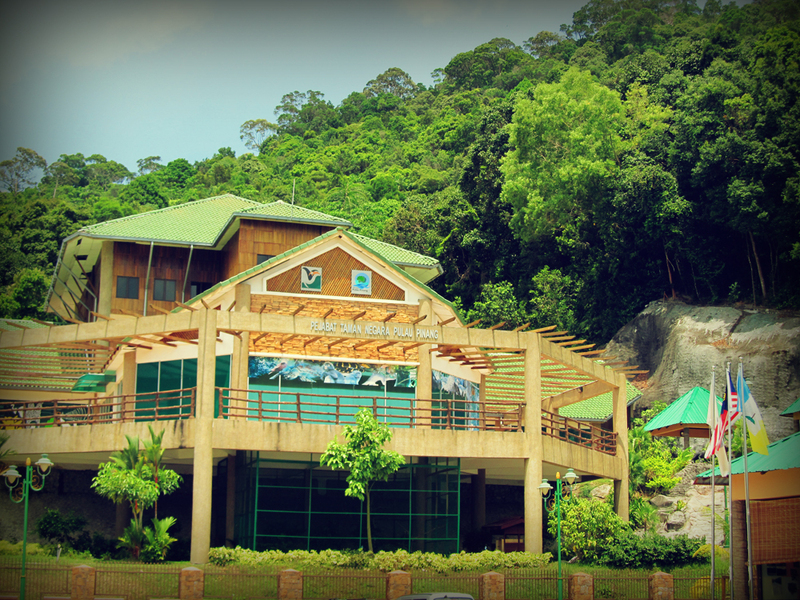 Visitors will need to register (for free) before and after entering the park at the reception area as shown above. 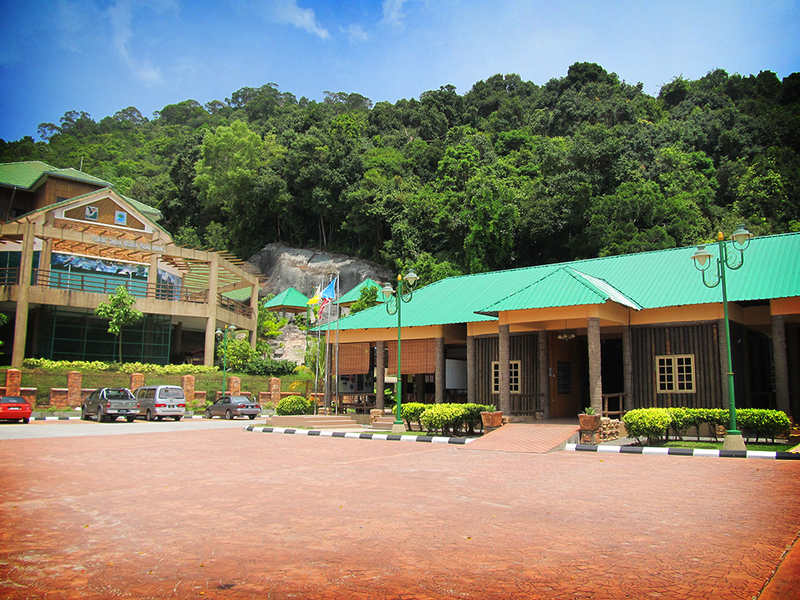 An information counter as well as public shower rooms are available there too. 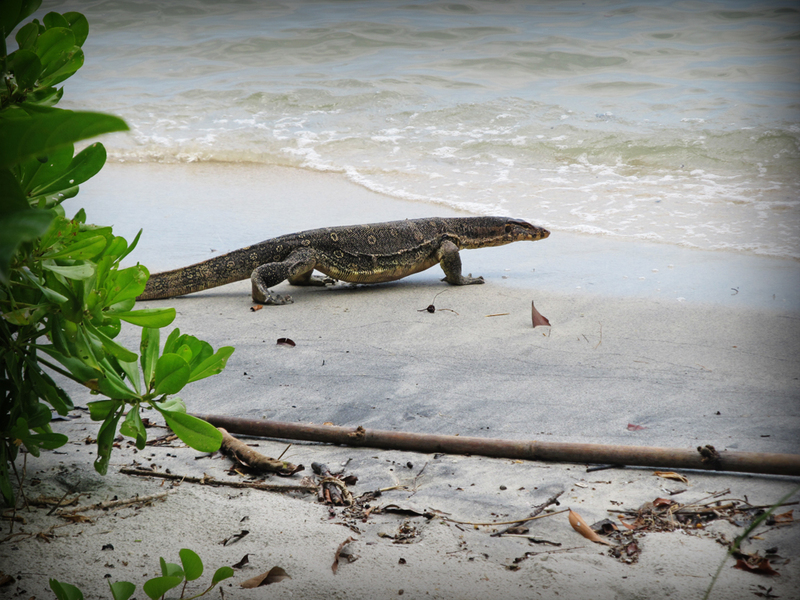 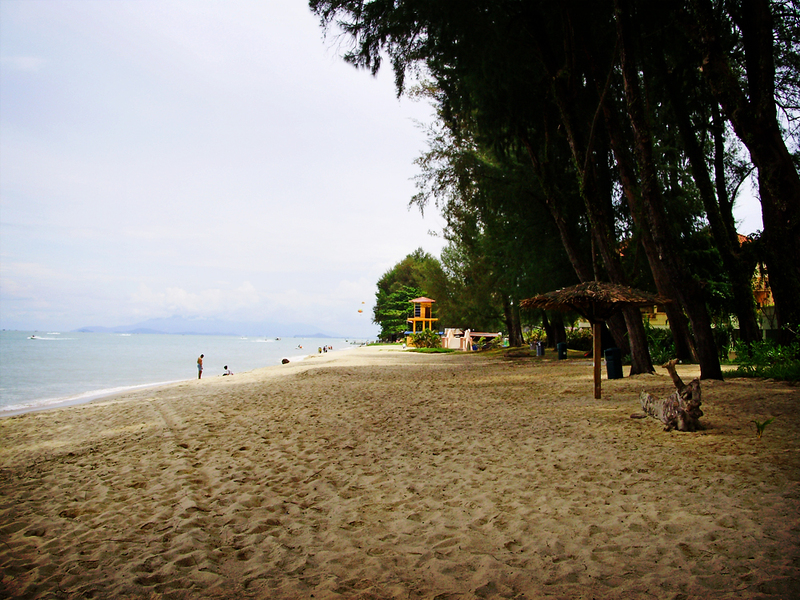 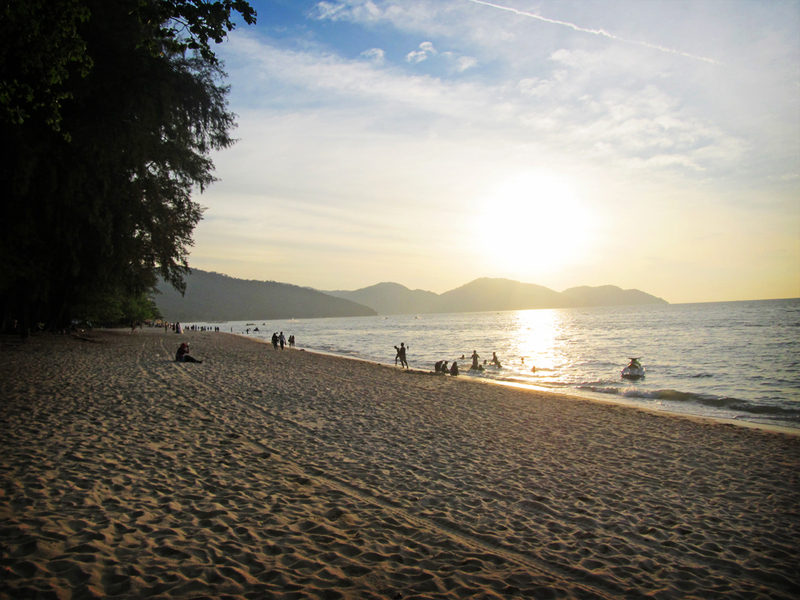 The beach is also home to monitor lizards which like to take a stroll on the sands and swimming at the sea on sunny days. 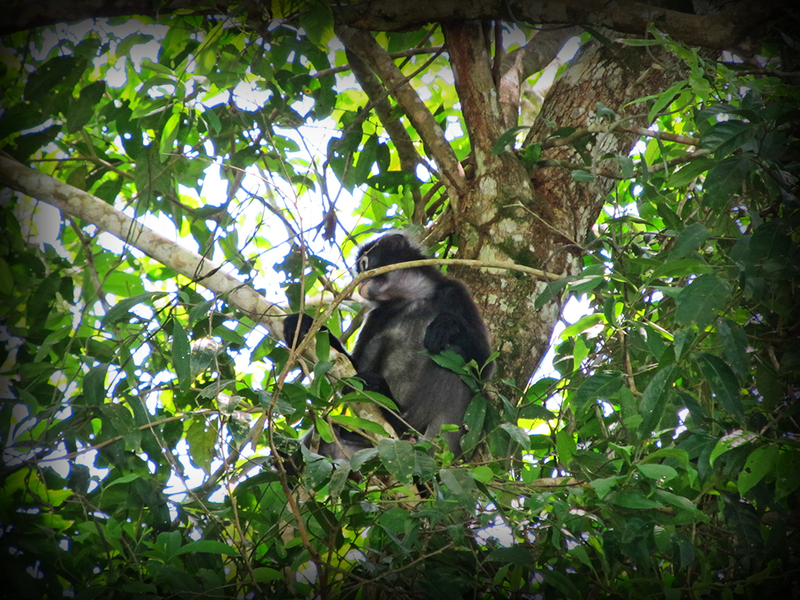 The trees of the forst is also home to Dusky Leaf monkeys resting or swinging at the branches on sunny days. 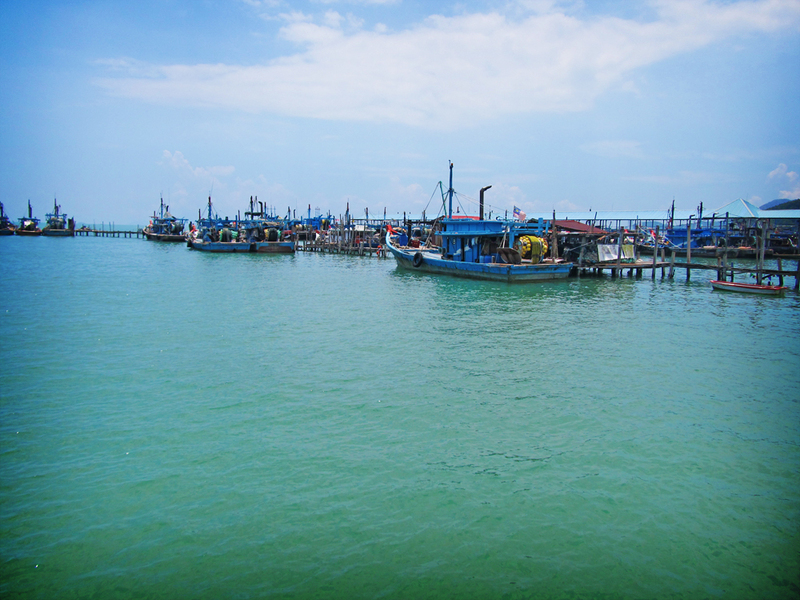 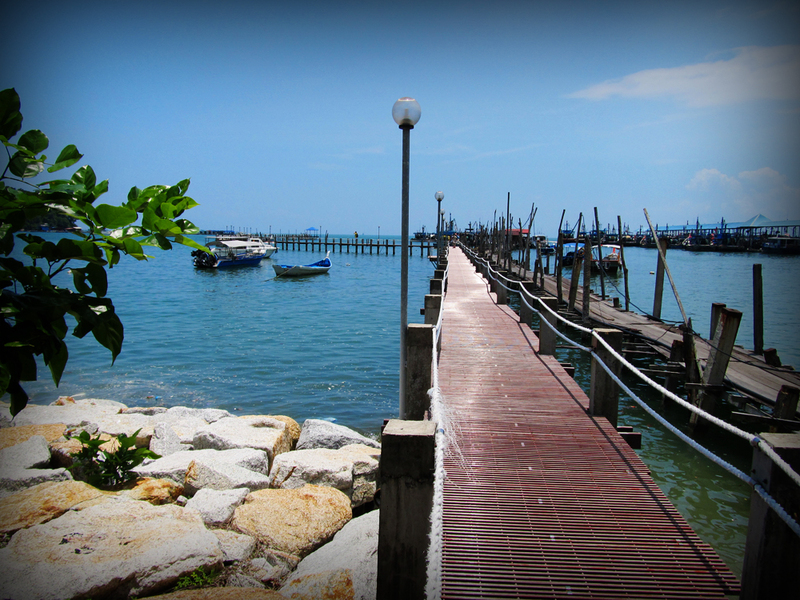 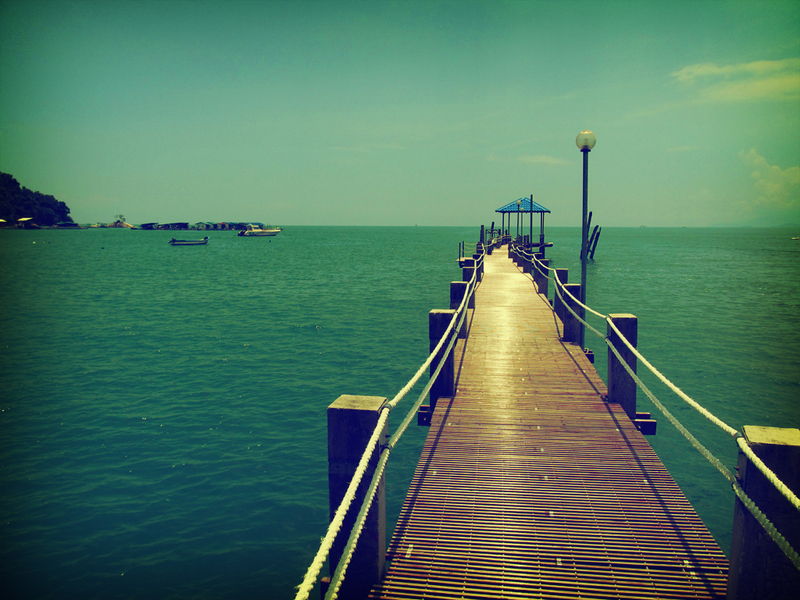 Just in front of the National Park Office, is the nearby fishermen jetty where fishing boats dock and also where one can find boat-for-hire to travel by sea to the beaches located at the National Park area. 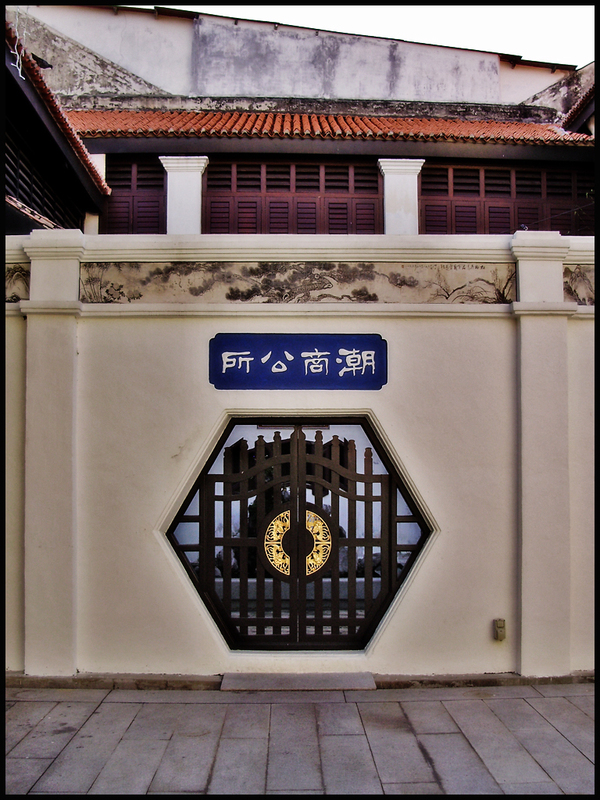 The Buppharam Buddhist Temple (Wat Buppharam), located at Pulau Tikus in Penang, was built in the year 1942 by Luang Por Sri Keow, a Buddhist monk. 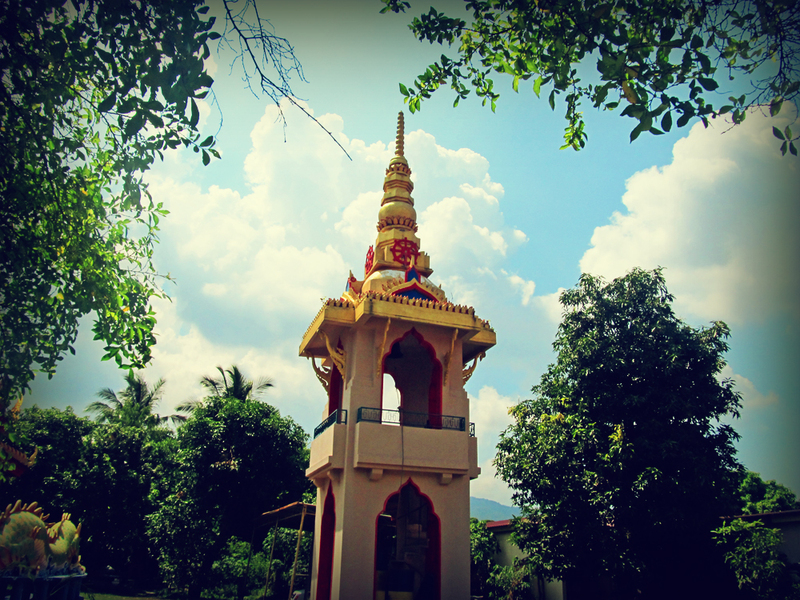 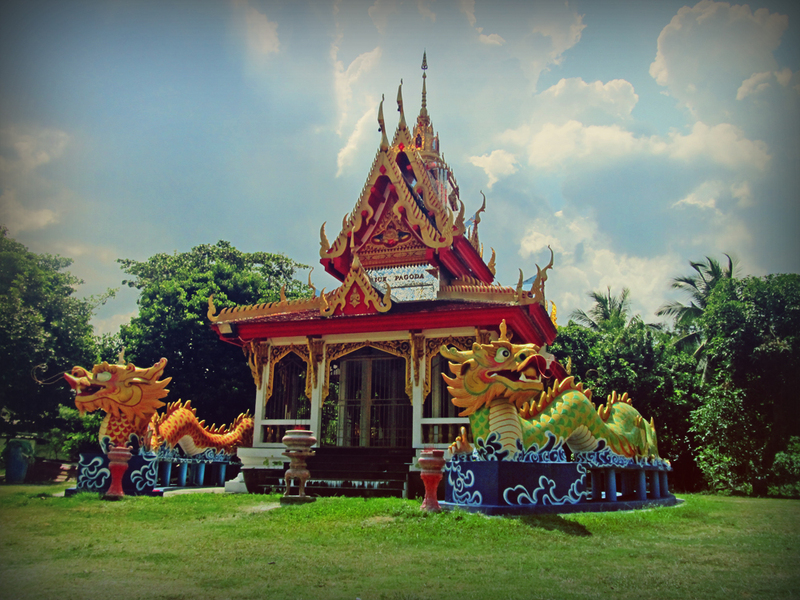 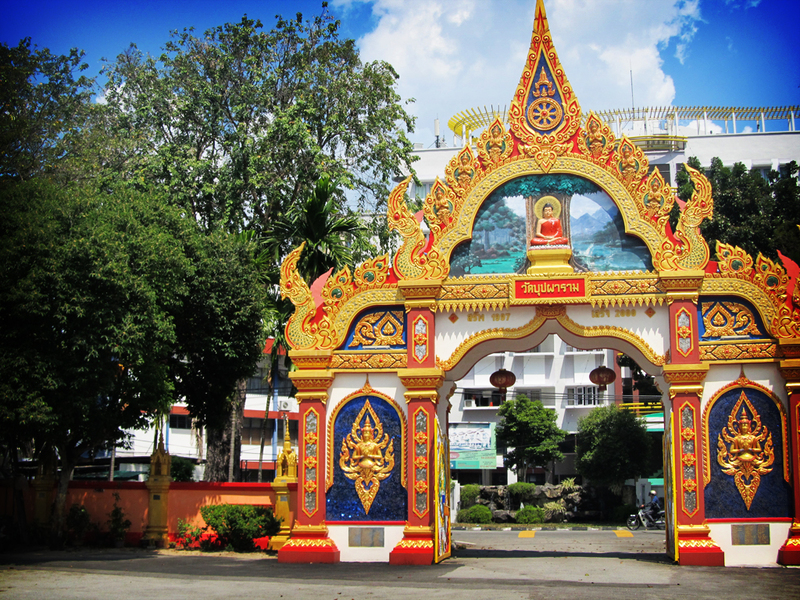 The name Wat Buppharam is also known as Flower Temple. 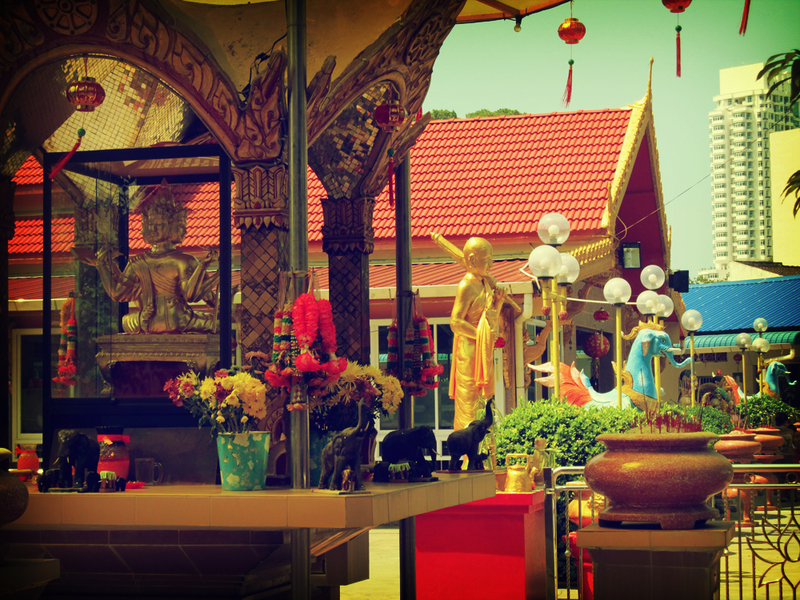 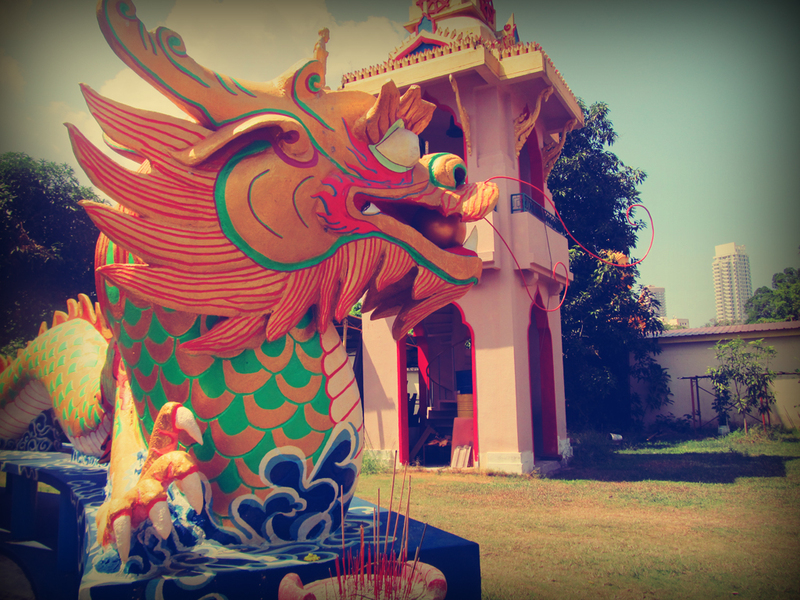 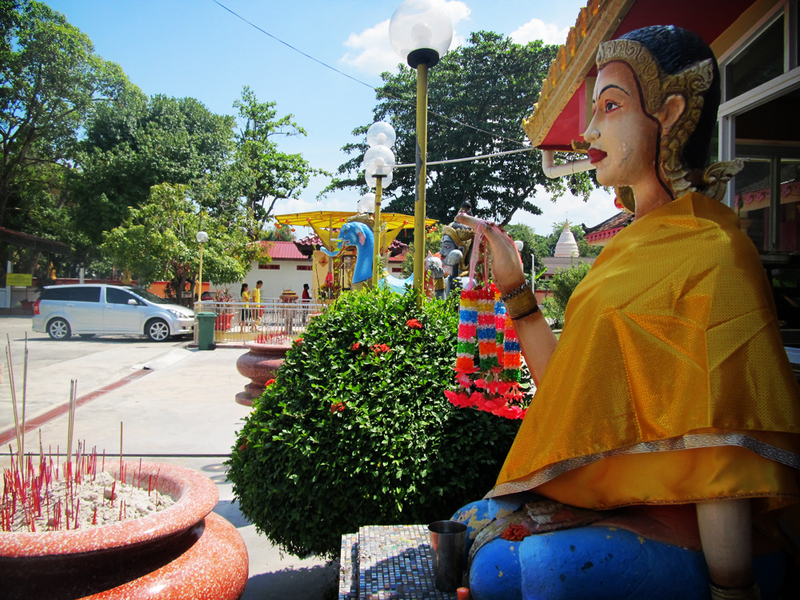 Various legendary and mythical figures of Buddhism and Taoisim origins can be found around the temple complex. 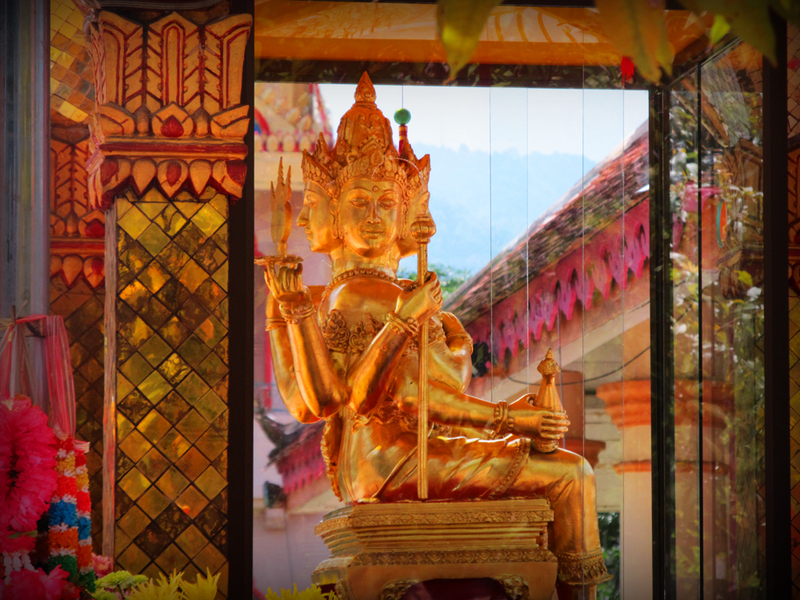 The temple is well known for its ‘Lifting Buddha’, a 100-years old Buddha statue where worshippers seek answers or prayers from. 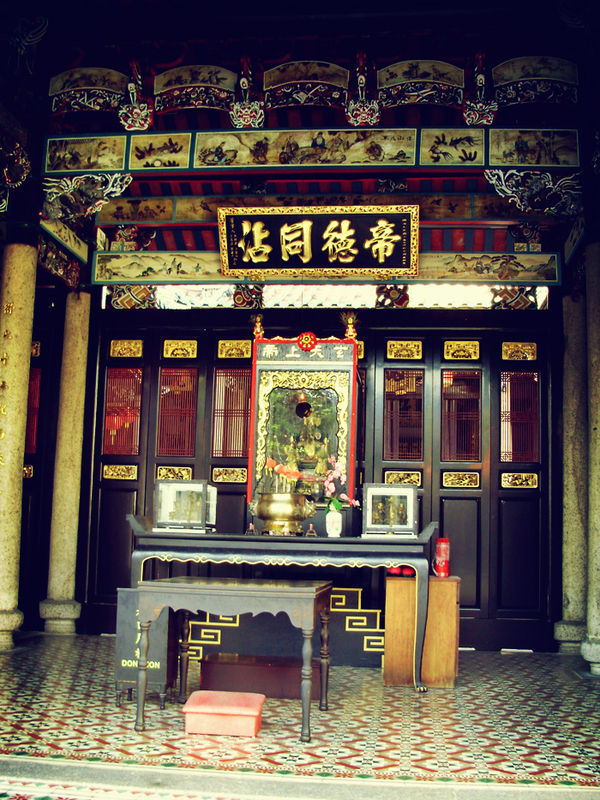 Besides that, the temple also offers services such as providing protective amulets. 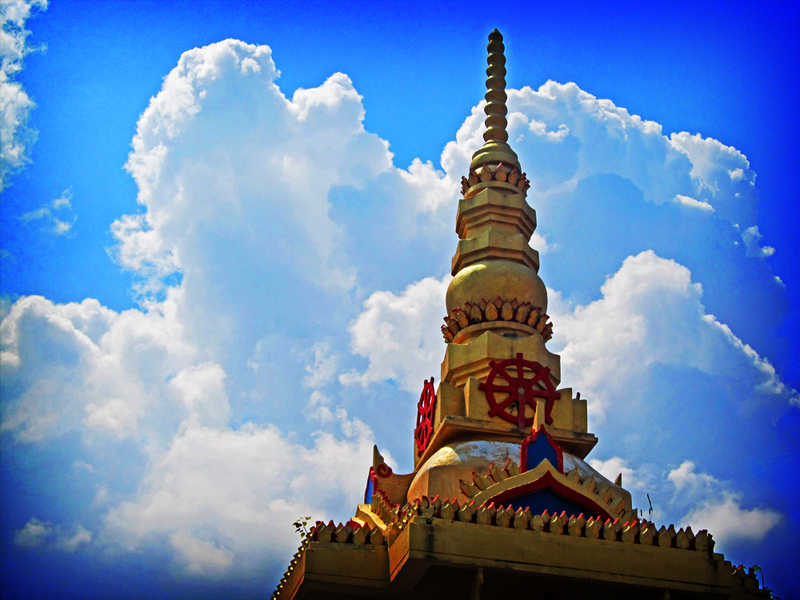 The temple recently has an official website at http://www.watbuppharam.com/.